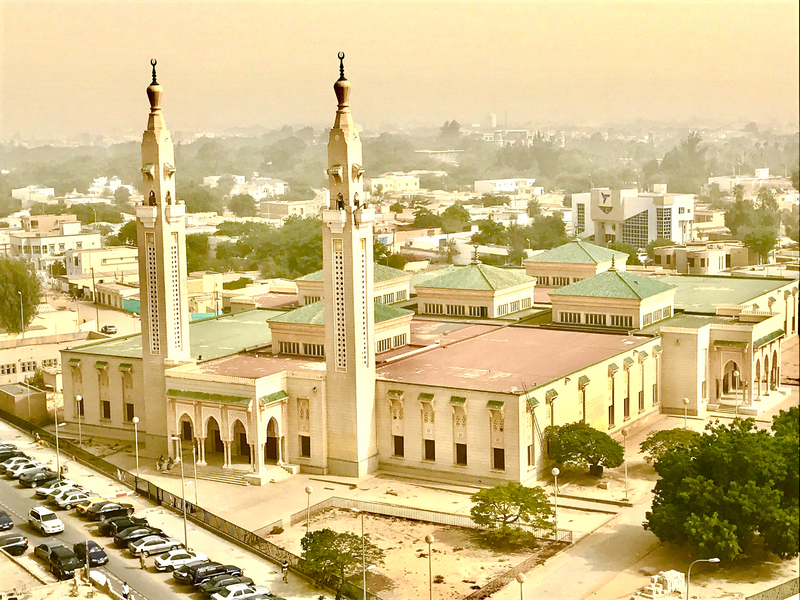 IMPORTANT NOTE: This article is part of a 12-chapter series on my trip to Africa: Mauritania was the ninth country of twelve African nations I visited in December of 2016. It’s best to read the chapters in order, as they build on one another. To see countries number one through eight, please go HERE. It’s best to read the stories/countries in order. Mauritania was a country I found when searching Google for the “least visited countries in the world.” There it was, at number 13. I’d never even heard of Mauritania, and the little I found online just added to the intrigue. 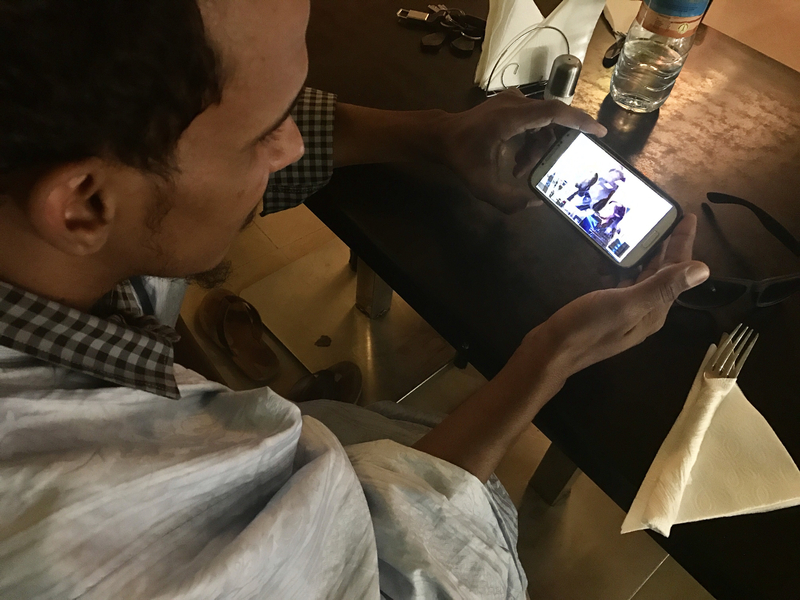 I think I insulted a Mauritanian who took offense to me calling the country “mysterious” on Instagram, but it was mysterious to me. 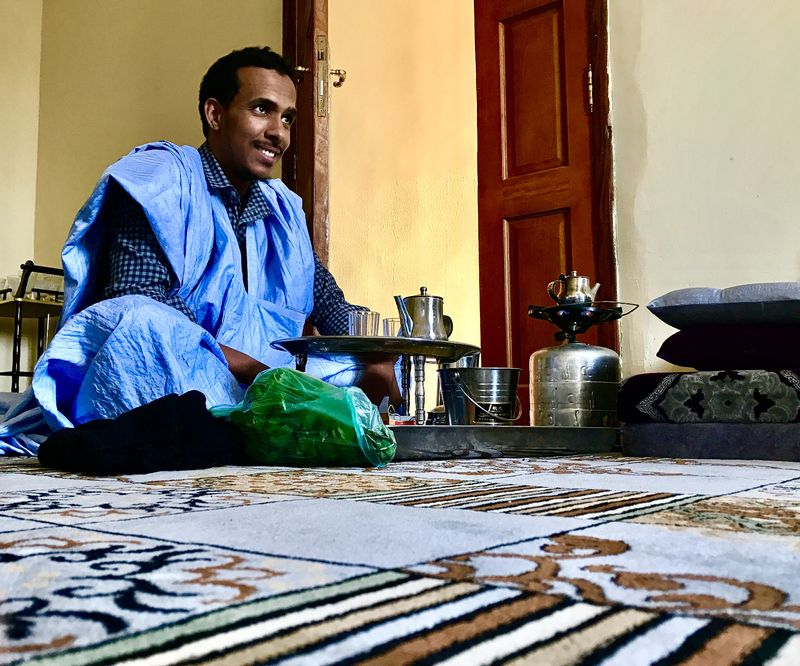 Everything about Mauritania was an unknown that I was dying to delve into and experience myself. 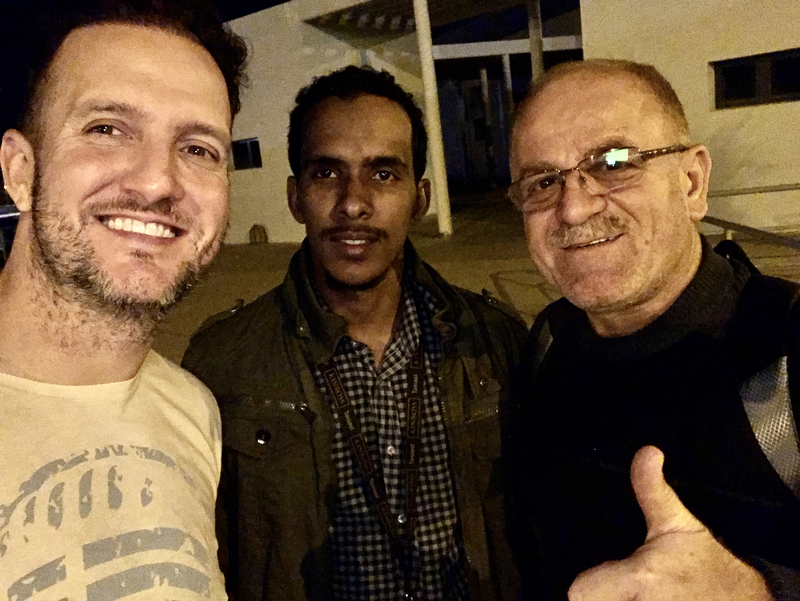 I arrived past midnight from Morocco and by the time I got my visa and my guide Lemine dropped me off at the hotel, it was almost 2AM. I passed out. The next thing I know I was being awakened by donkeys and roosters. I looked out my window and saw that the lodge I was staying in was right next to a camp. Not sure that’s what you’d call it—but it was a little area of makeshift houses without real doors and windows. This little hotel was probably the most “real” lodging I’d experienced so far on this trip of 12 African countries. 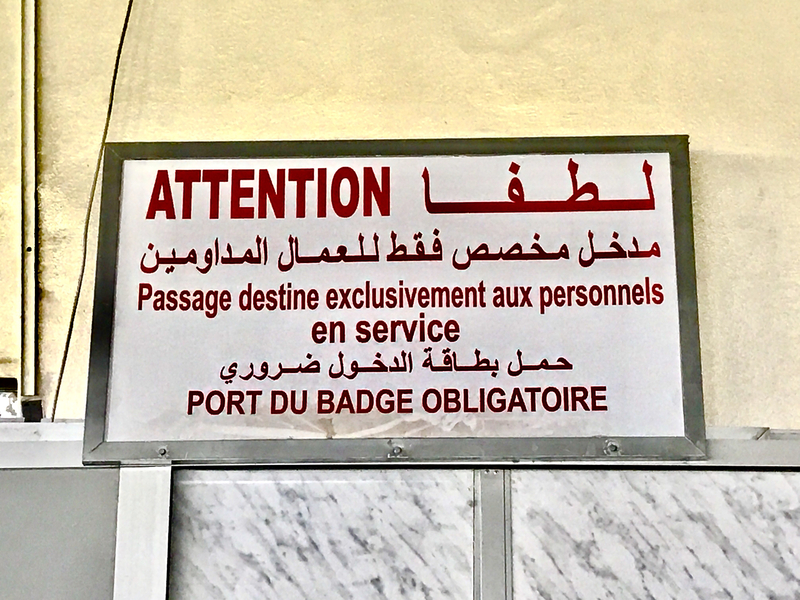 Funny, because just the night before I was at the fanciest one of the journey: The Sheraton Towers Casablanca, which was ultra swanky and luxurious. And now, just hours later, I’m in a tiny guest house on a dirt road next to wooden shacks. If there’s one thing one must be able to do when traveling, is adapt. The quaint lodge where I stayed. 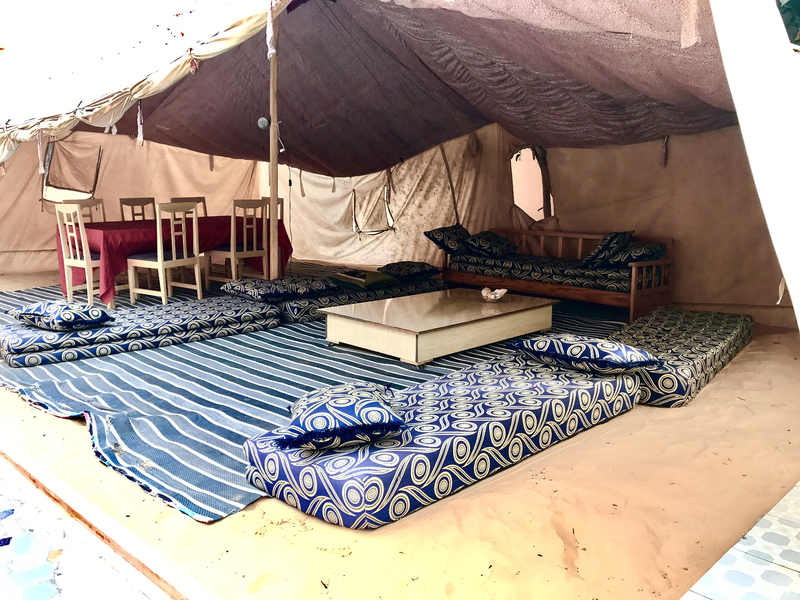 The “bedouin” type lounge, inside the lodge’s courtyard. “Breakfast” consisted of croissants, a banana and black coffee; on the second floor terrace. Then it was off with Lemine to see the capital, Nouakchott. 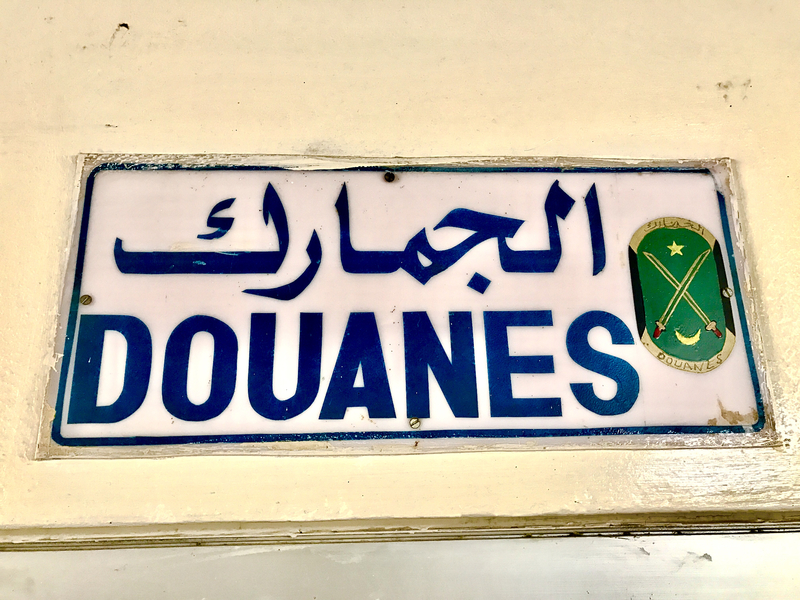 It took me months to memorize Nouakchott’s spelling, by the way—but I finally got it down. 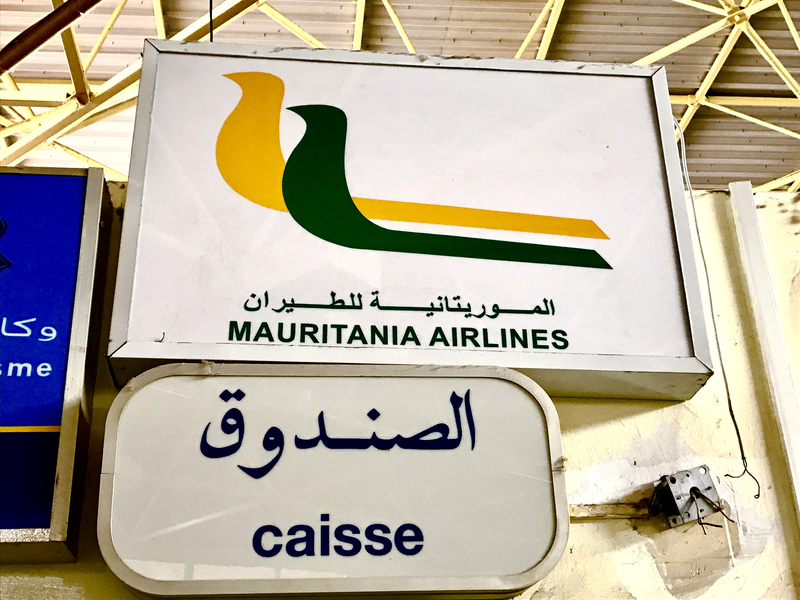 Mauritania was very tranquil compared to most of the other African countries I’d seen earlier in the month. Besides the very center of town where traffic seemed to bunch up, we drove down a lot of dusty, barren roads. 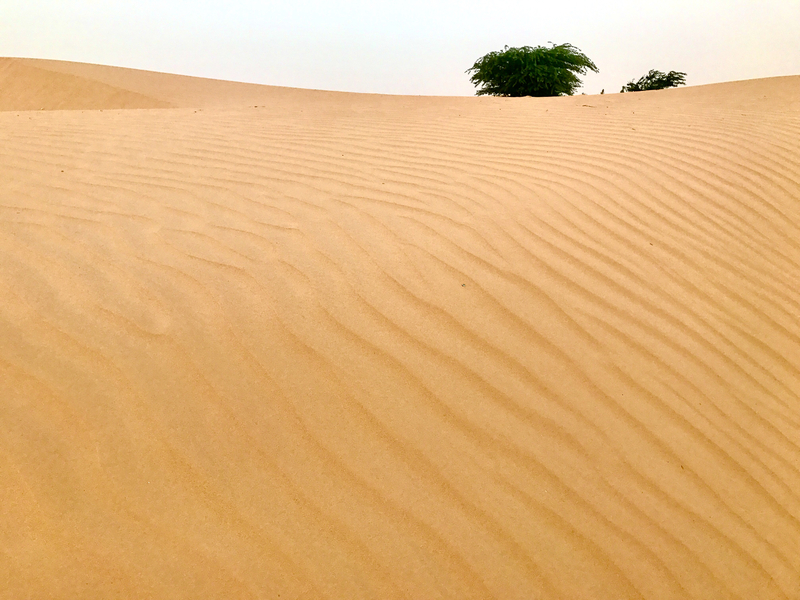 Mauritania is part of the Saharan Desert and that meant sand everywhere, including in the back of my throat by midday. I figured that’s why many of the men here wore scarves covering most of their face, leaving just their eyes in view. This was the kind of gear I’m used to seeing Al-Qaeda wear, while toting their AK47s on the evening news. Yup, this trip was a lesson in prejudices and generalizations for me. Growing up as an American, the only time I’d see people who looked, dressed and spoke like this, was in movies about terrorists, or on news reports about rebels, kidnappers and general all around “bad guys.” I had to keep reminding myself that this was an entire culture of good people that simply practiced a different culture, dress and lifestyle than me; not necessarily made up of the caricatures and criminals that I’ve been presented on TV for my entire life. I did the best to shake off the decades of imagery and plot lines I’d been fed over the years. I imagined that maybe there was a foreigner visiting the U.S. for the first time, and that maybe he had the same kind of fears I did: that he had maybe watched American gangster movies his whole life, and thought all the US was about was crime mobs, gangs and drive-bys. 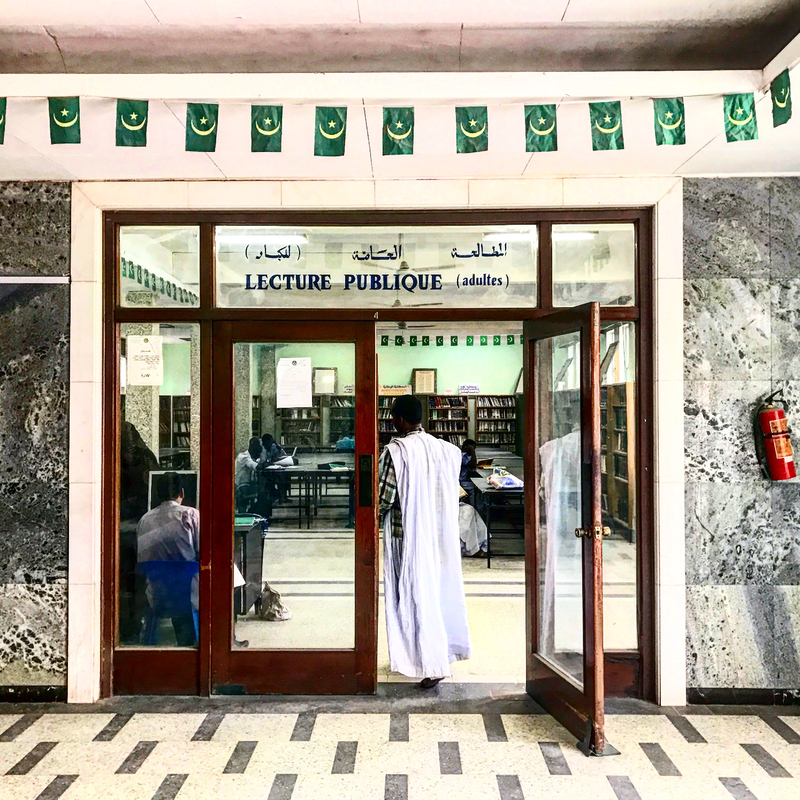 Every second in Mauritania was enlightening. 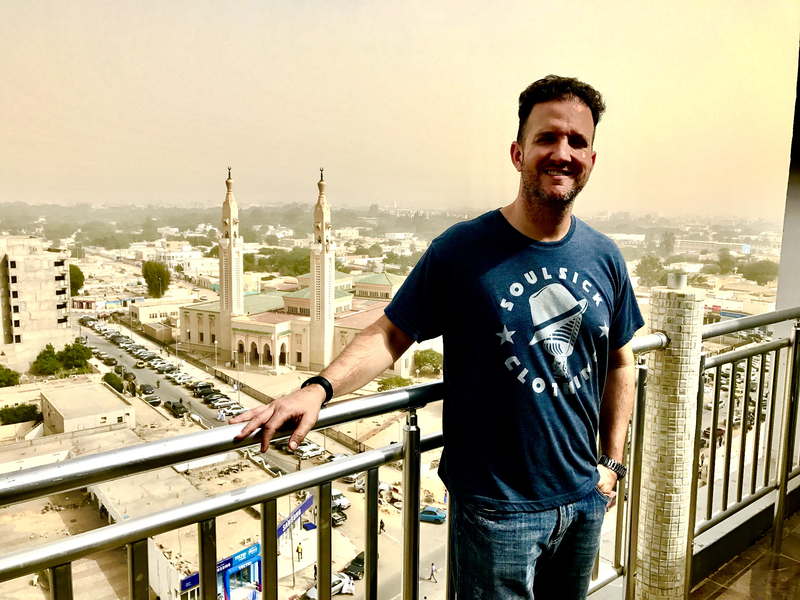 Our first stop of the day was the city’s Mosque Saudique, where we snapped a couple photos and then headed to the market. 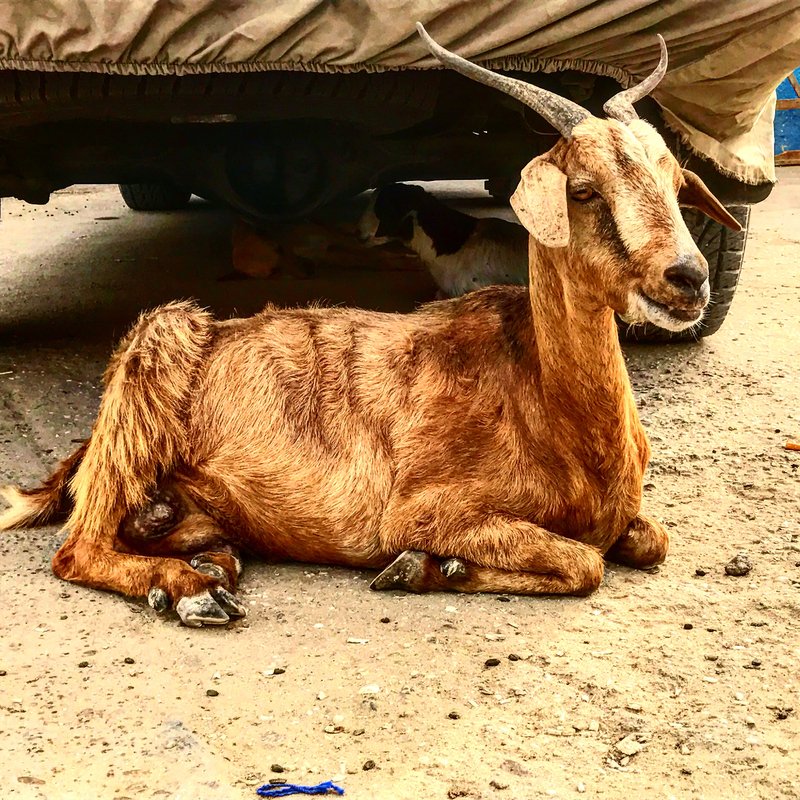 The market was cool, and like the streets of Nouakchott, a tad more relaxed than the chaos I’d seen at my previous stops in Africa. 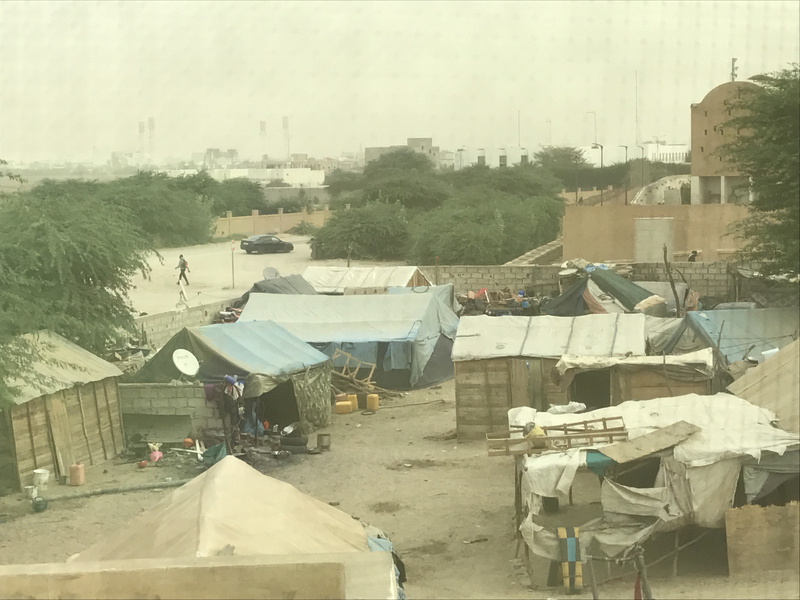 We stopped to ride the elevator to the top floor of the Al Khaima building and take some photos from the tenth floor balcony before moving on. At a crafts store we met up with another gentleman on tour with us, Hasan, and then the three of us headed to lunch. Top of the Al Khaima building, downtown. 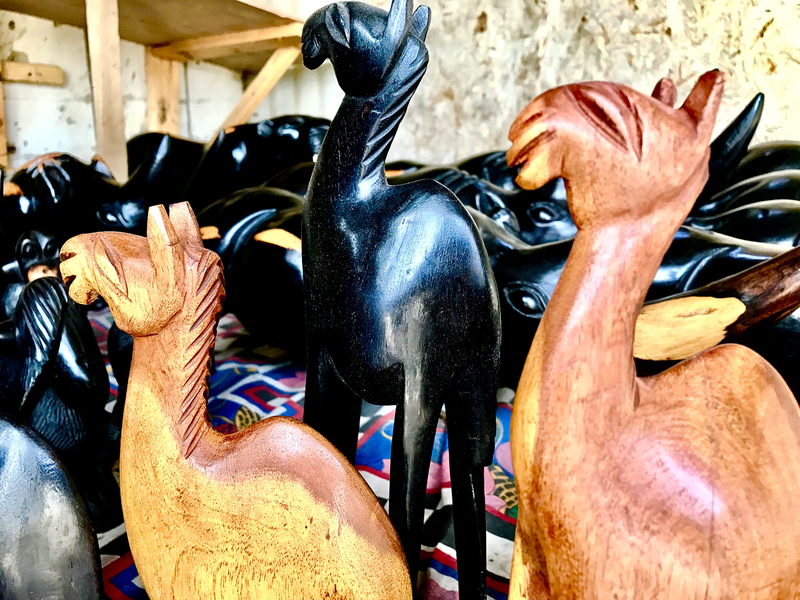 A wood carver makes camel statues. 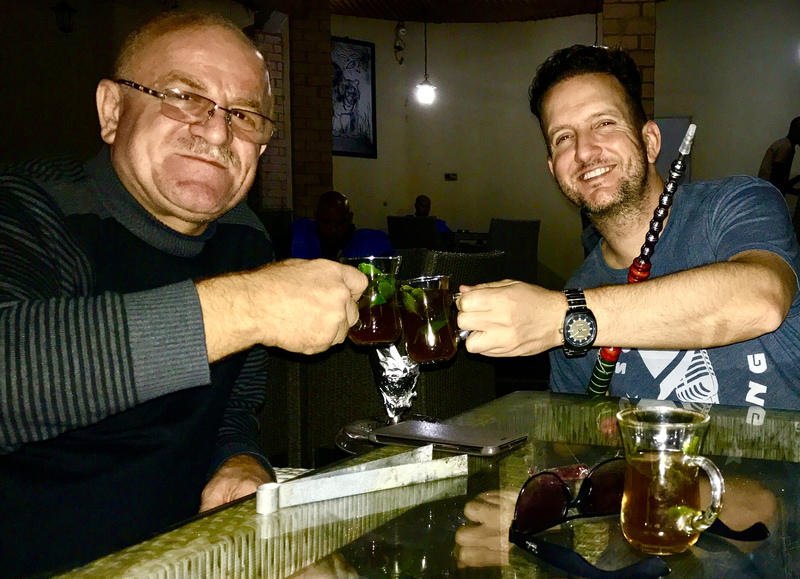 I’d lucked out on this trip: not only was Lemine an outstanding guide, but his other guest, Hasan, ended up becoming a good friend of mine. Hasan’s story was pretty incredible. 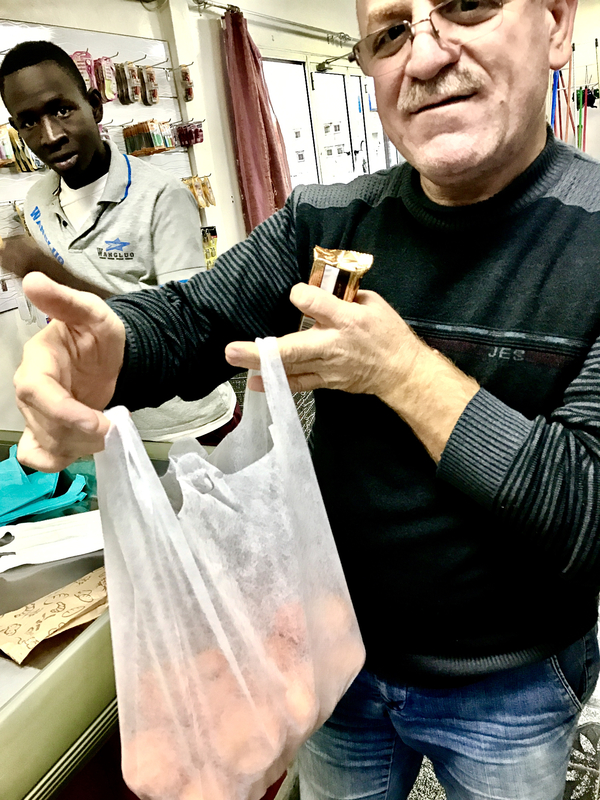 He was originally from Syria, had moved to Russia and spent decades there, but was now living in Algeria. I was taken aback when he told me that he still had family in Aleppo. 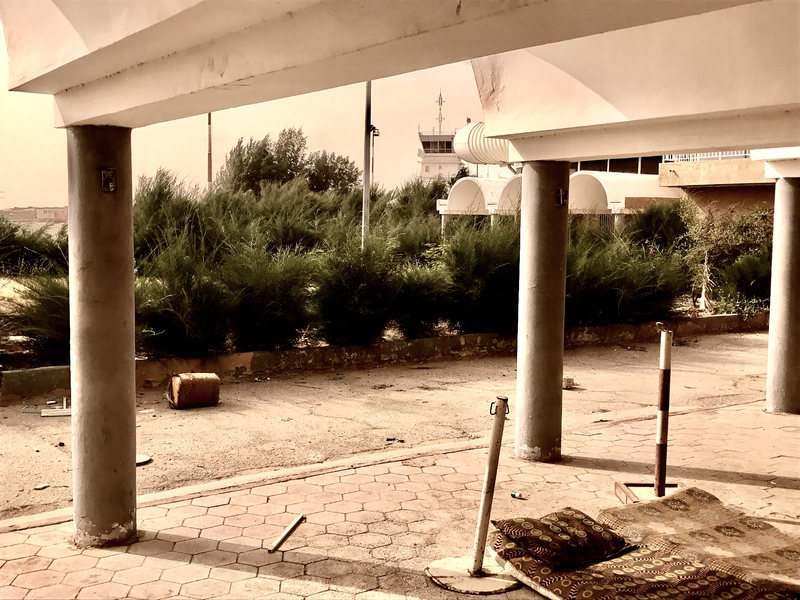 He told me of a meeting between him and his son at the Syrian border; and that Hasan wasn’t allowed to come in, and his son couldn’t leave. 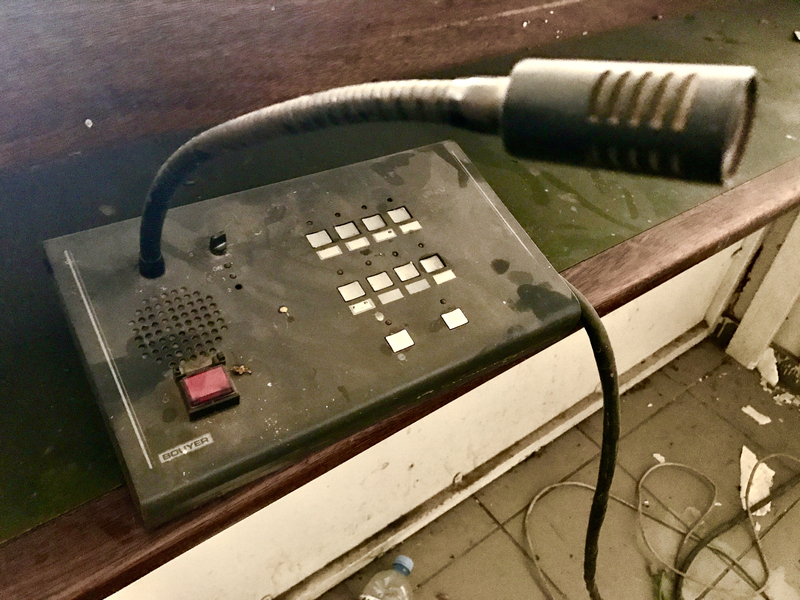 This was the kind of stuff you hear about on the nightly World News, and here I am, cruising around the dusty streets of Nouakchott, hearing it first hand. Unbelievable! I came to know both Lemine and Hasan very well over the next 48 hours, and both were stand up gentlemen. Lemine was just an all around cool cat: a family man who took his work, religion and work very seriously. And Hasan must have been one of the most considerate people I’ve ever met in my life. He bought Lemine and me Snickers bars and mandarin oranges at the supermarket, and would even peel the fruits and hand them to Lemine while he was driving. It was a fun trio, and we exchanged non-stop stories and learned about each other’s cultures throughout our journeys. 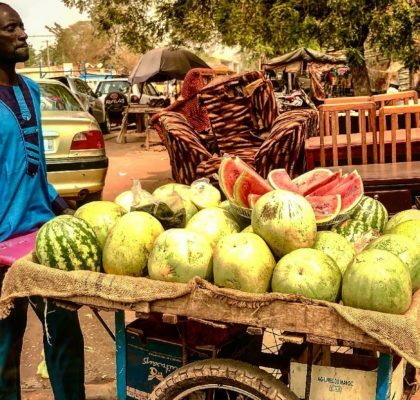 Hasan at the market, buying oranges and Snickers bars for the road. After lunch and some chill time back at the hotel, we all headed over to the port and watched the fishermen come in after a hard day’s work. This was super interesting and I’m pretty sure the main attraction for visitors of Mauritania. 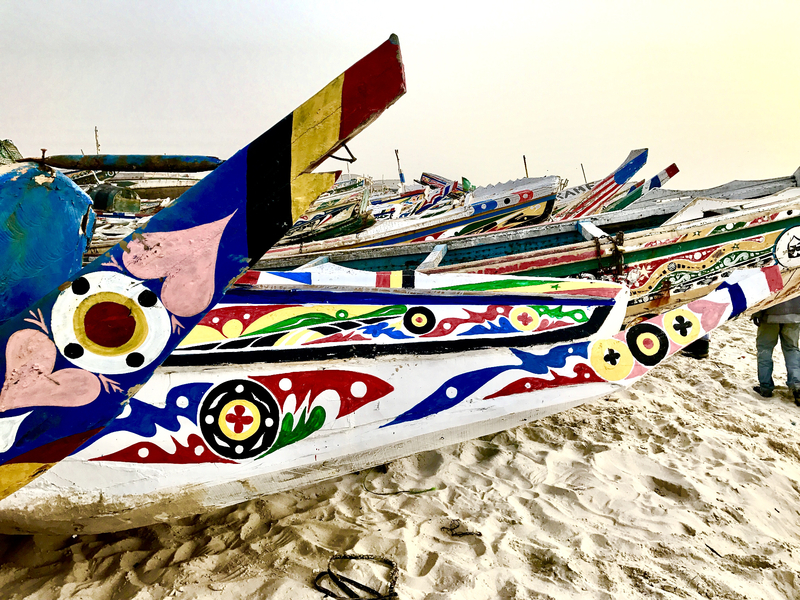 There must have been thousands of these wooden, colorfully painted fishing boats, at sea, at shore and in between. The men who’d come to shore would get their boats up on to the banks by placing empty metal tanks under the heavy boats, and then rolling the boats forward, using the tanks as “rollers” to move the heavy crafts. 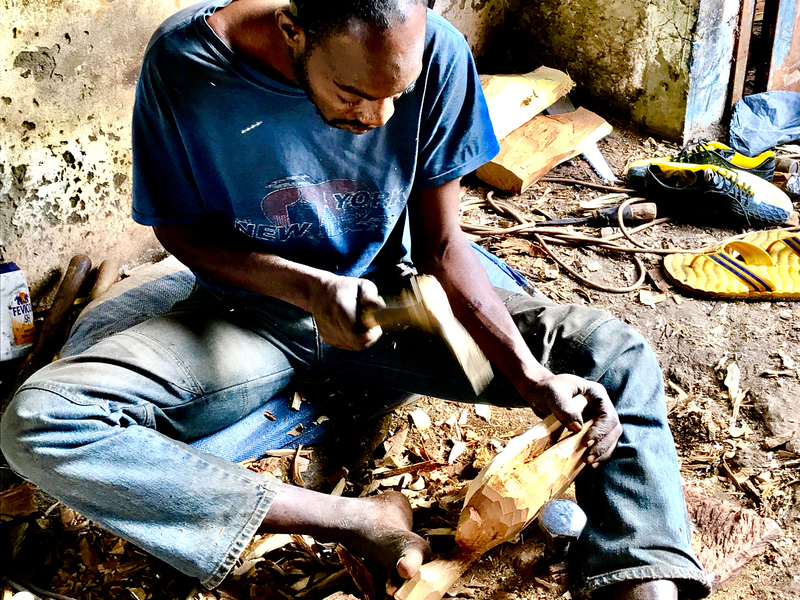 I quickly learned that most things in Mauritania were done by hand. 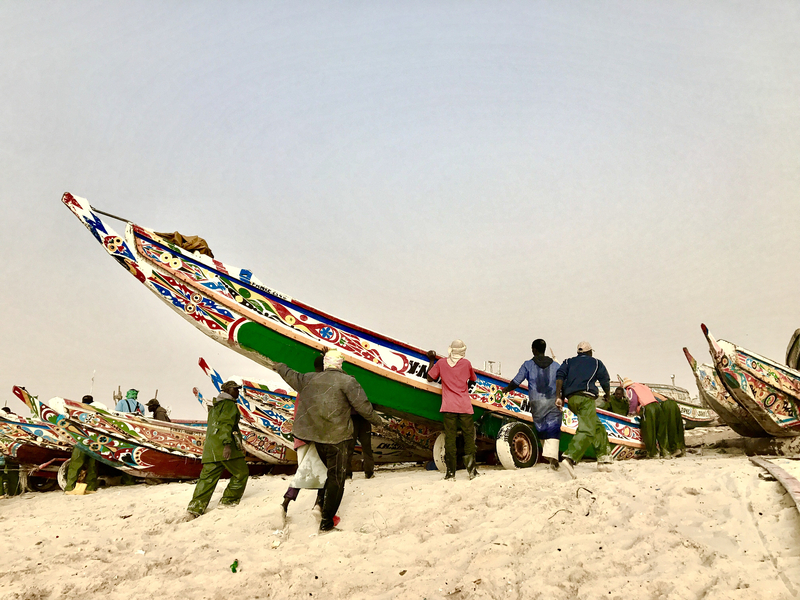 The boats built by hand, the fish caught by hand (with nets), the boats pulled up onto shore by hand. 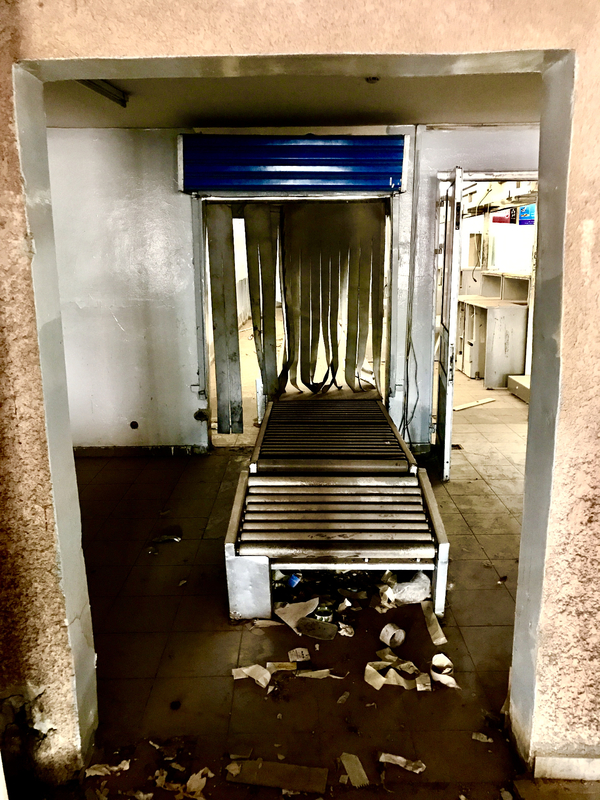 There just wasn’t any of the machinery you’d normally see automate all the hard work; it was simply bare hands and brute strength. 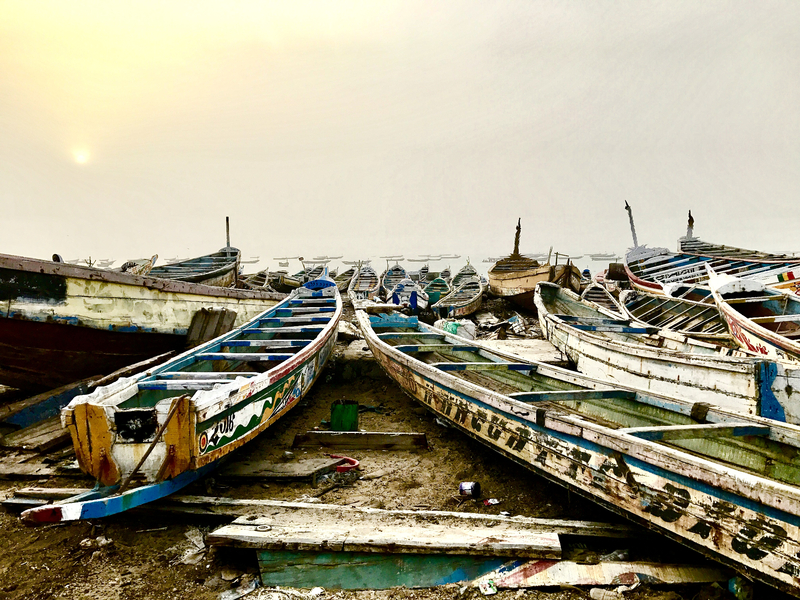 At the port: thousands of colorful wooden fishing boats line the beach. Every boat was painted with beautiful patterns. The skies were very hazy (sand, dust?) The sun barely penetrated the haze. Fishermen bring their boats in for the night. A couple hundred feet from the water you could see the people selling their “catch;” mounds of fish piled up on the concrete waiting to be bought. There were big wooden tables where folks were cleaning, cutting and de-scaling their goods. 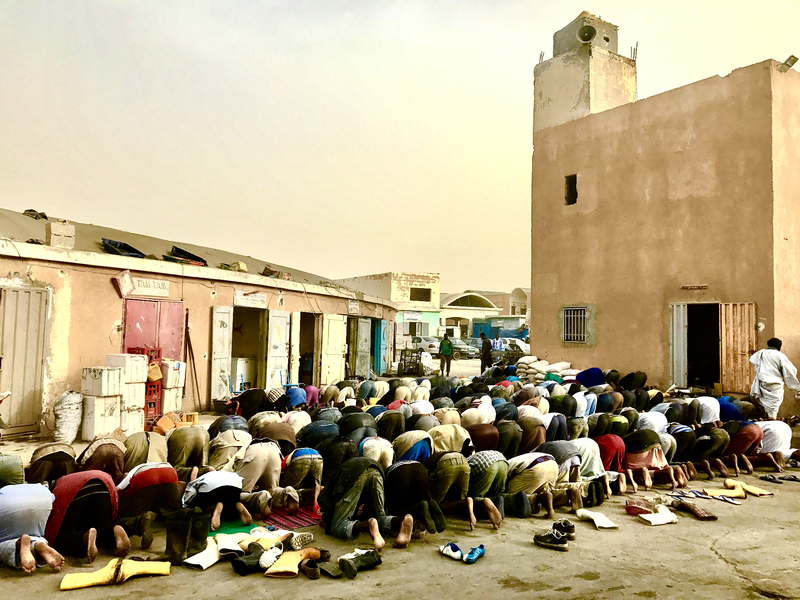 Lemine and Hasan soon excused theirselves for 5PM prayer, as they joined a hundred or so others gathered in front of a small mosque, just a few feet away from the fish. 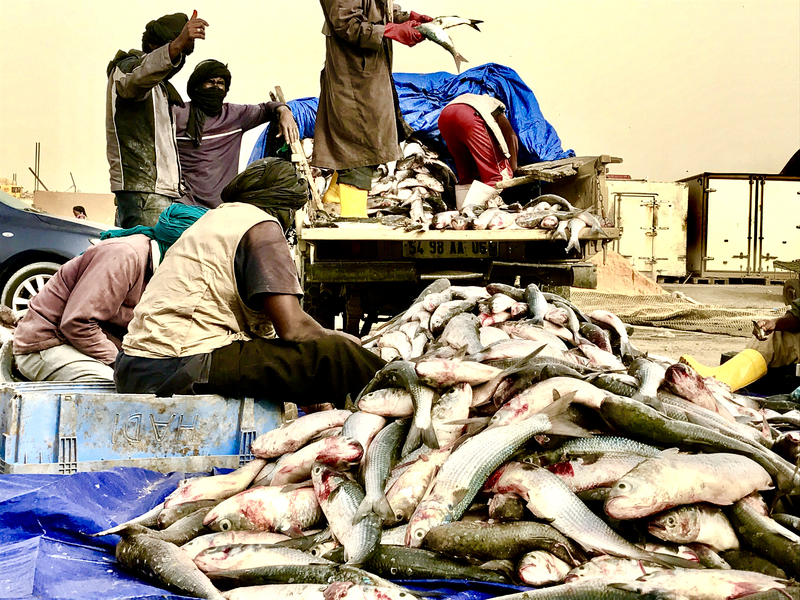 Ramblin’ Fact: Most of the fishermen here aren’t Mauritanian, rather they’re immigrants from Senegal and The Gambia. 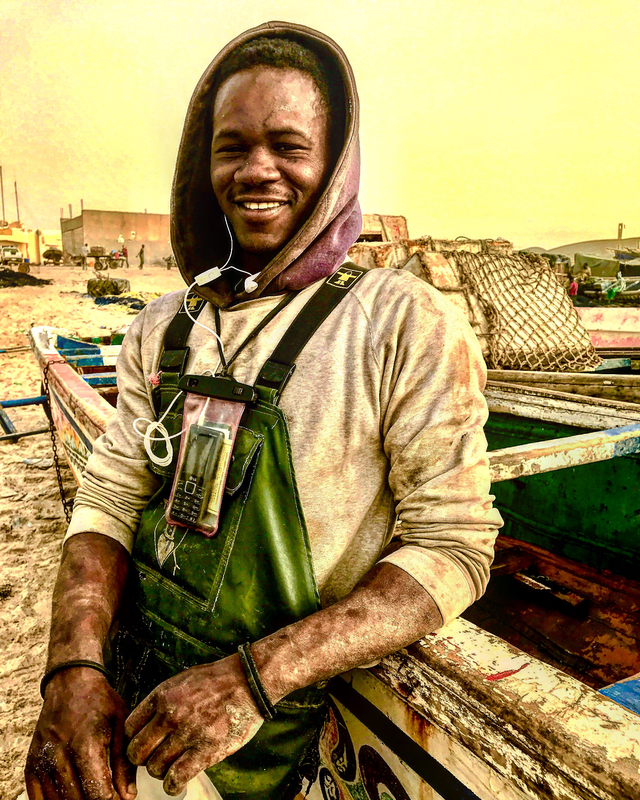 Senegalese fisherman after a day’s work at sea. 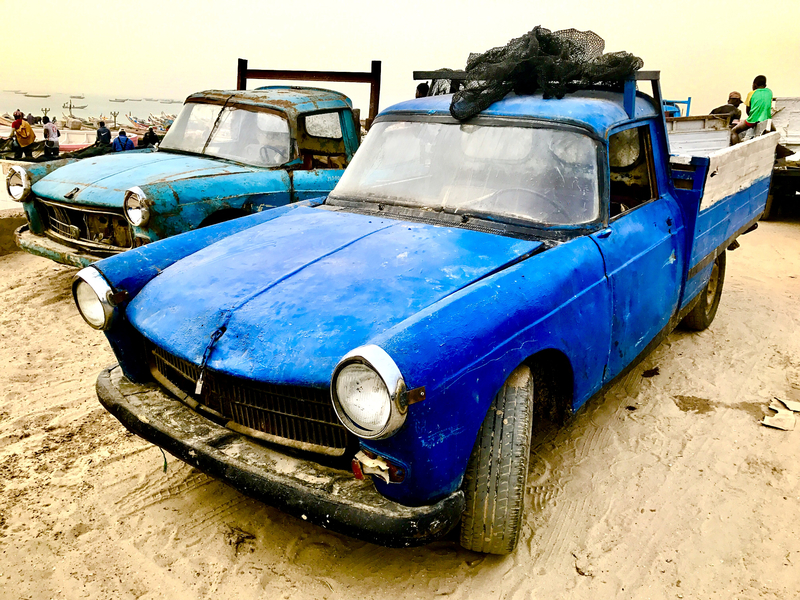 Dozens of ancient Peugeot trucks ready to fill their beds with the day’s catch. 5PM prayer at the fish market. After the port we headed to dinner, where afterwards Hasan and I enjoyed hookah (I was an amateur, he had to show me the ropes), and some amazing mint tea. We ate outside and the weather couldn’t have been more perfect. Mint tea and hookah with Hasan. 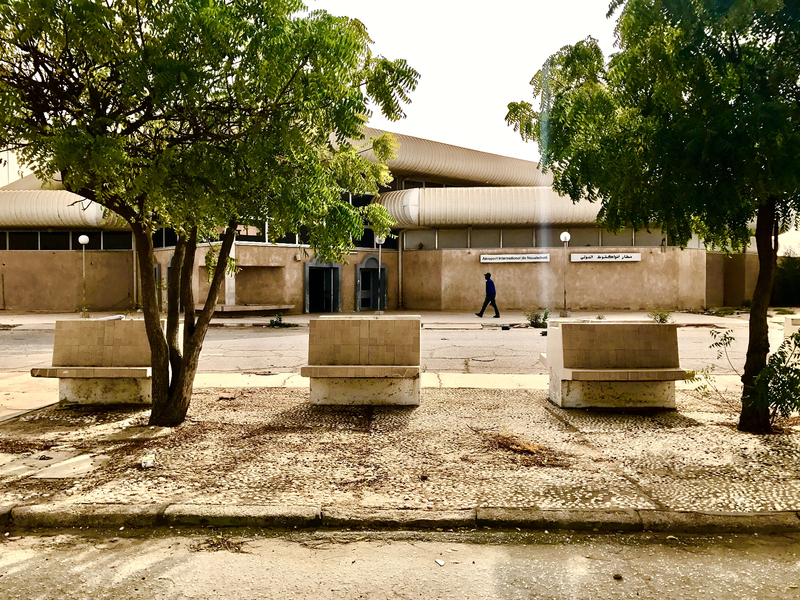 The next day Lemine let me in on a real treat: the old Nouakchott International Airport. 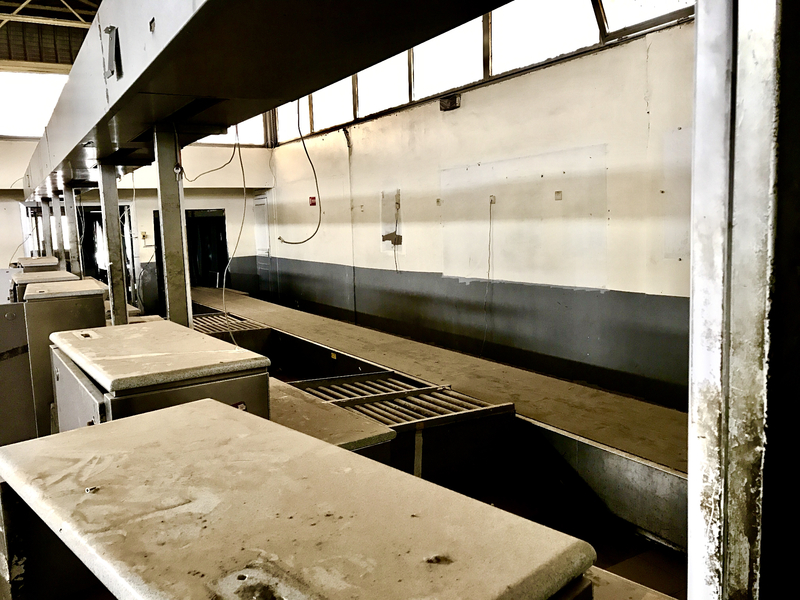 Exploring closed and abandoned buildings, ships, planes, etc. has always been my thing, I don’t know why. I soon learned Lemine was the guy with all the connections. 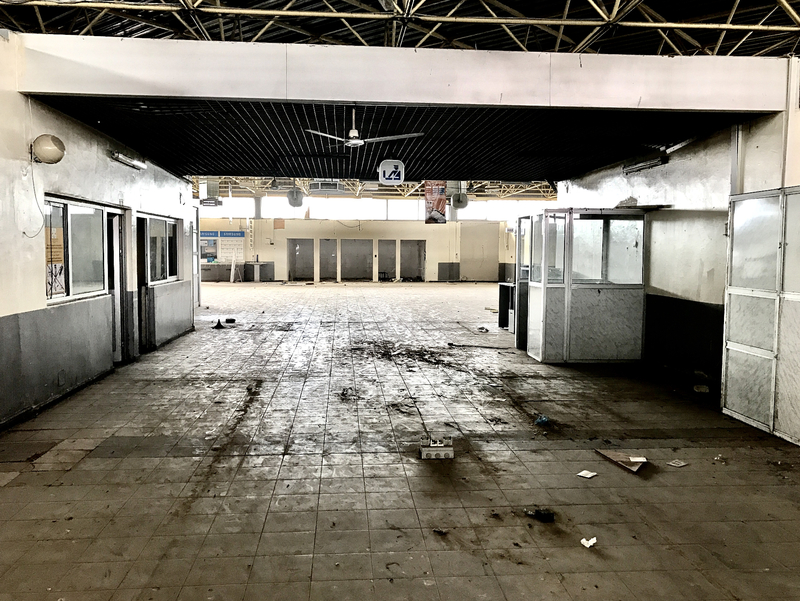 A few words with the security guard at the front, and we were in, given free range to roam around this closed airport. It’d actually only been shut down for six months—a new and bigger airport had just opened 15 miles outside of town, leaving the old one empty and without purpose. 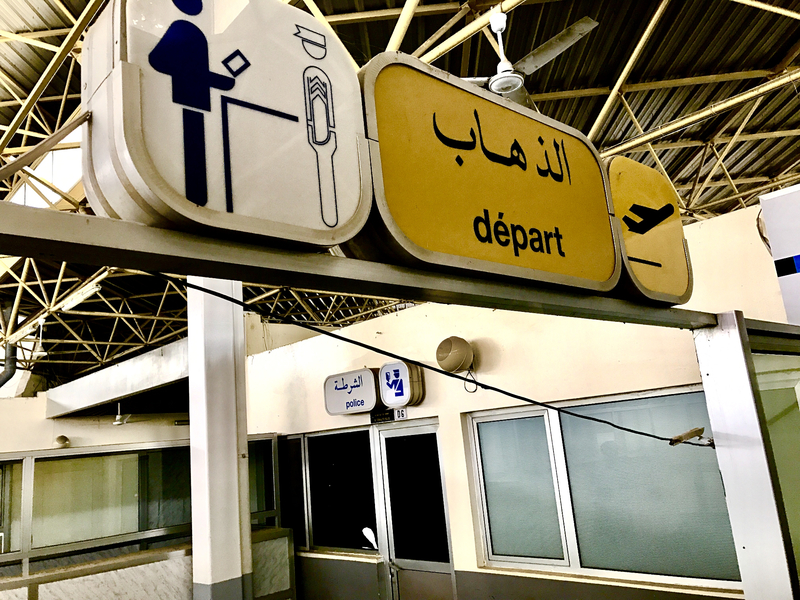 It was like an airport “ghost town,” as we explored the tickets counters, conveyor belts and departure lounges; all with a thick layer of Saharan sand on top of everything. This was one of the coolest stops for me! 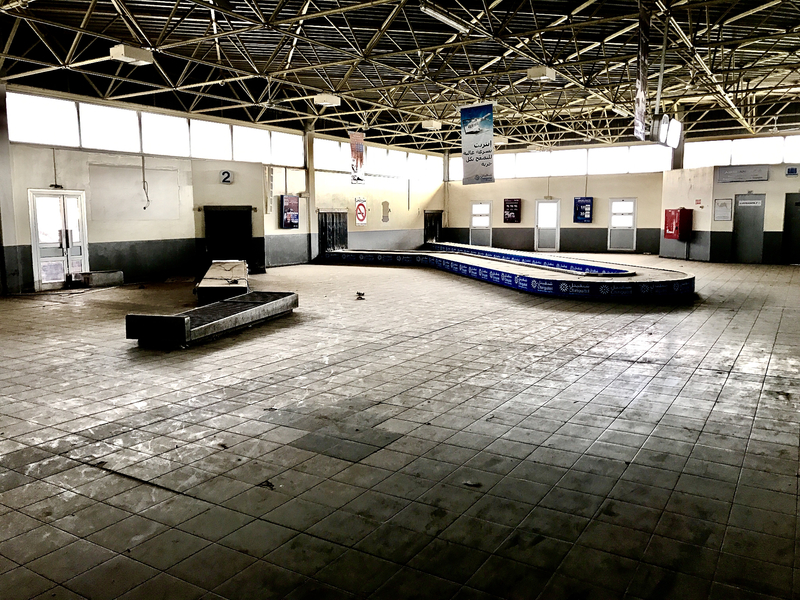 The empty parking lot at Nouakchott International Airport. 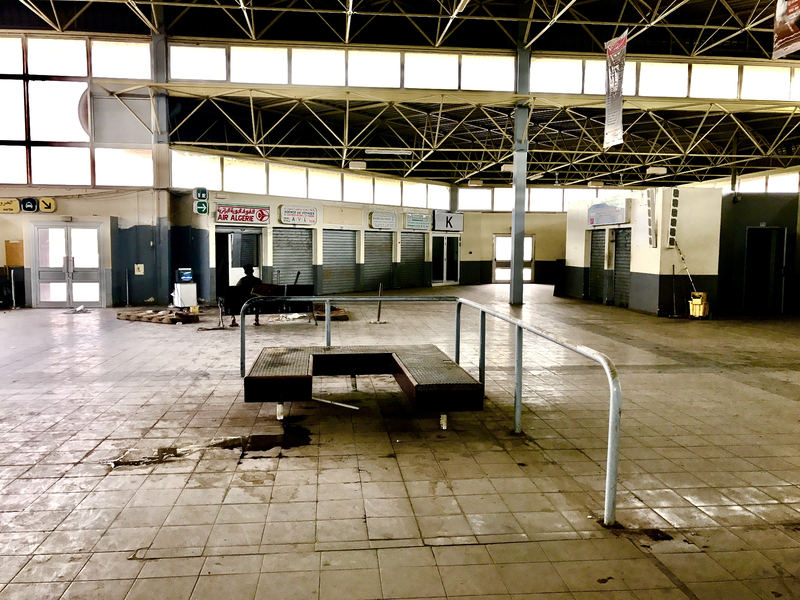 The old Nouakchott International Airport. Control tower in the distance, beyond the overgrown shrubs. 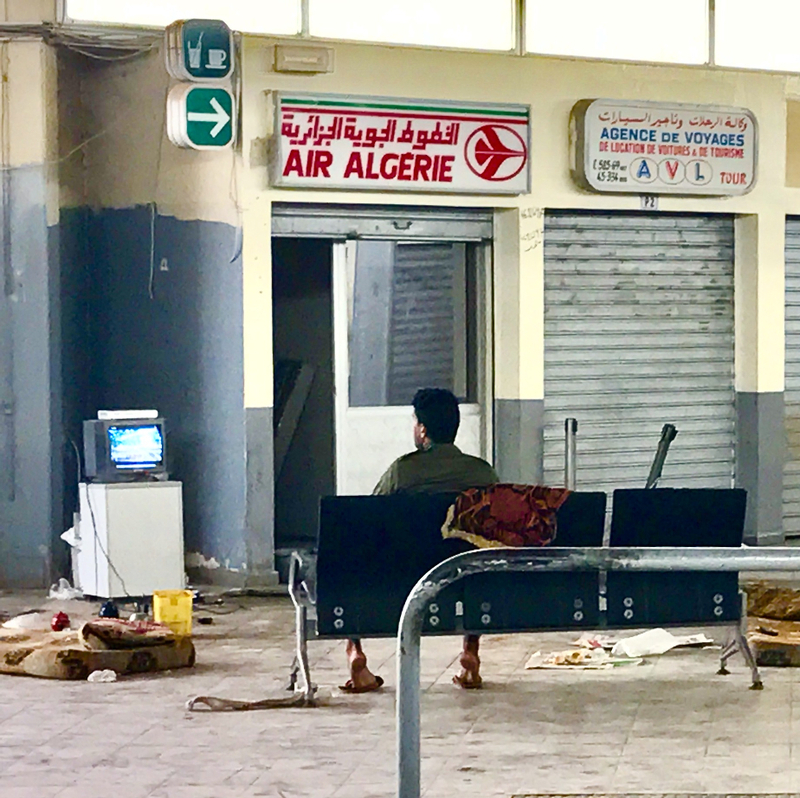 It looks like this gentlemen has made the airport his living room, watching TV from a bench. 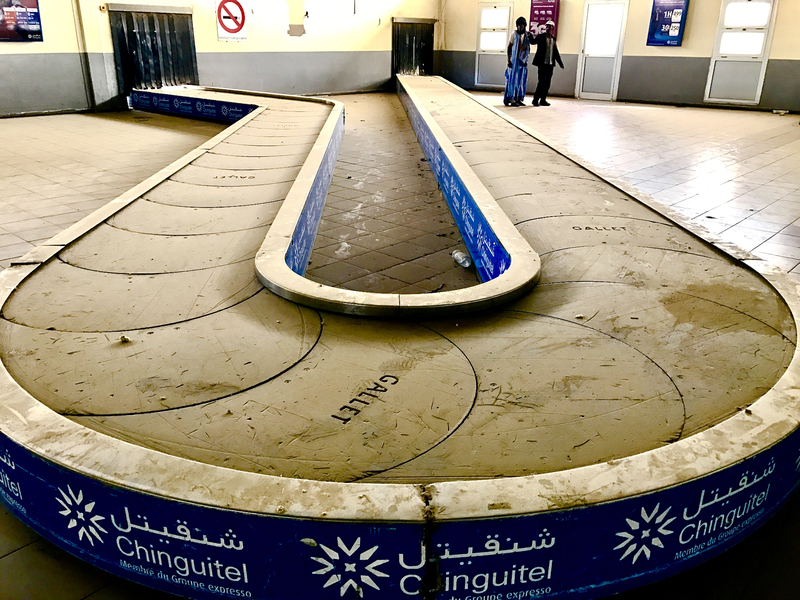 Checkin counters and baggage conveyor belts. 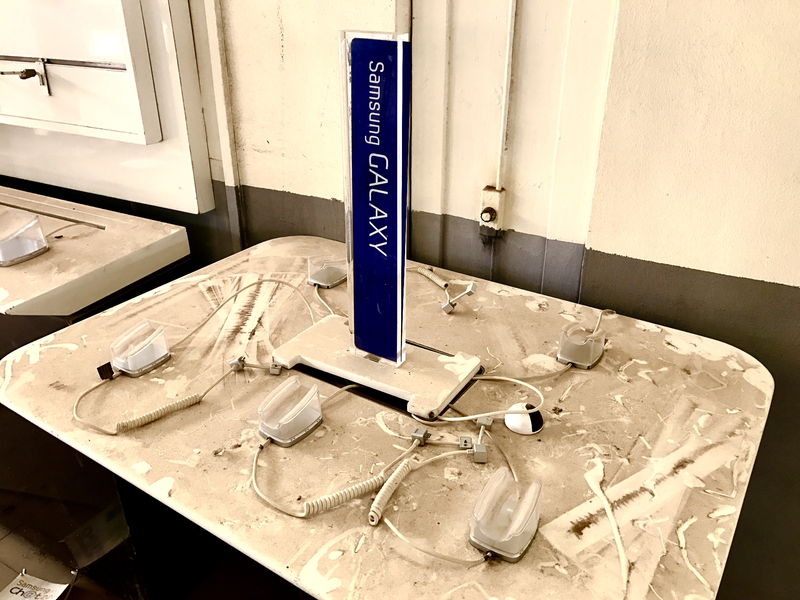 Charging station covered in sand. Piles of old immigration cards. After the awesome airport visit, we headed to Lemine’s house, where he’d invited Hasan and me for tea. This was another experience money couldn’t buy, as we all sat around in Lemine’s living room while he prepared a special mint tea for us that we sipped while eating croissants. 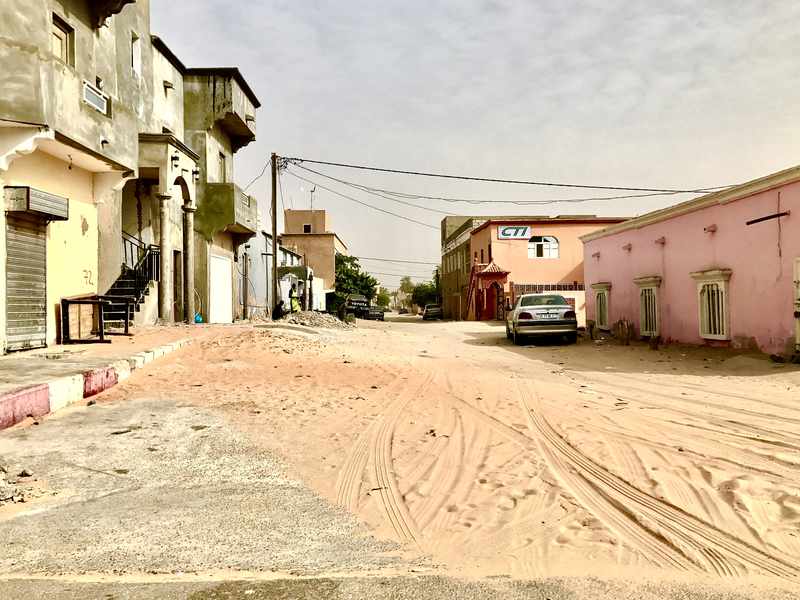 A standard residential street in Nouakchott. I showed Lemine a video of Geico’s “Hump Day” commercial. He didn’t get it. We grabbed Nutella crêpes at a restaurant called NKC Ice, and then drove over to a craft store. But the craft I loved the most was being “crafted” outside on the street. 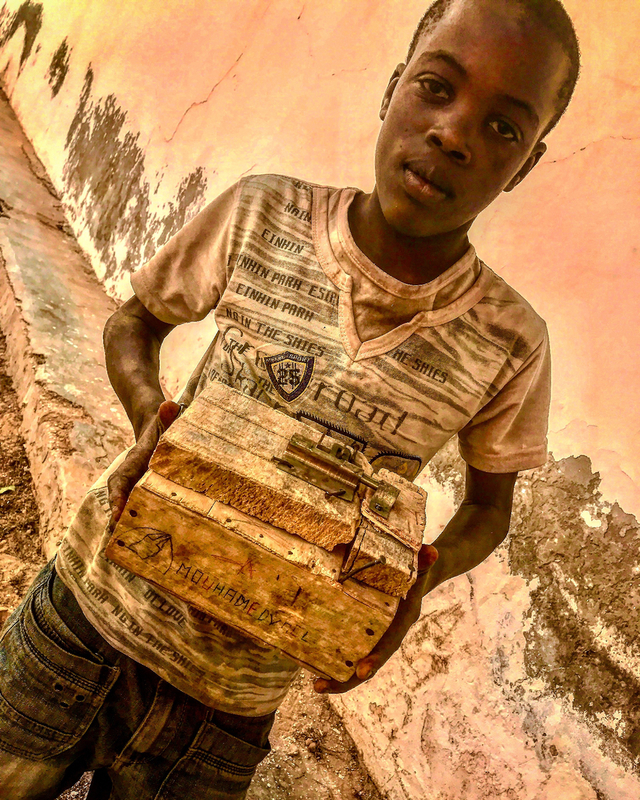 Two boys were hammering away on some wood. Curiosity got the best of me, and I approached to investigate. 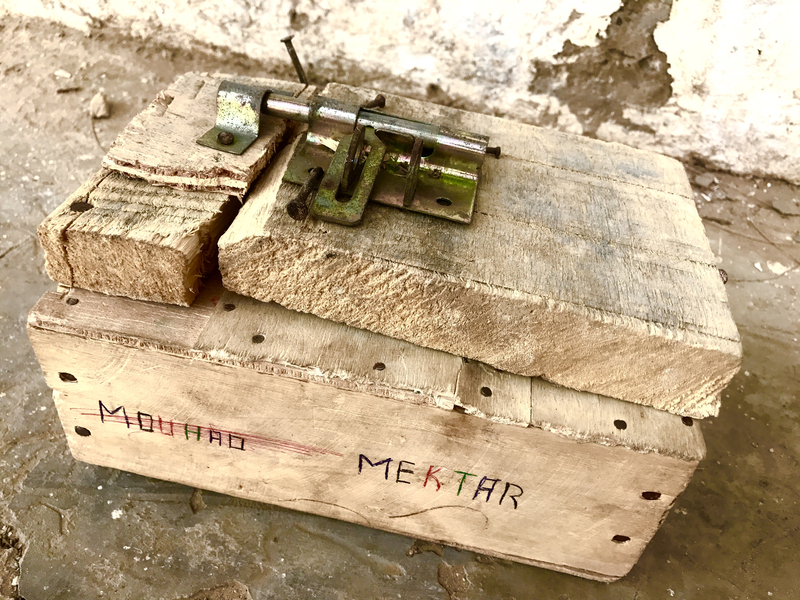 Turns out the kids were making a box out of wood, hinges and a lock; a homemade safe or piggy bank. Hasan made the first contribution to the bank, followed by me. The boy and his finished project. The piggy bank has a locking lid. 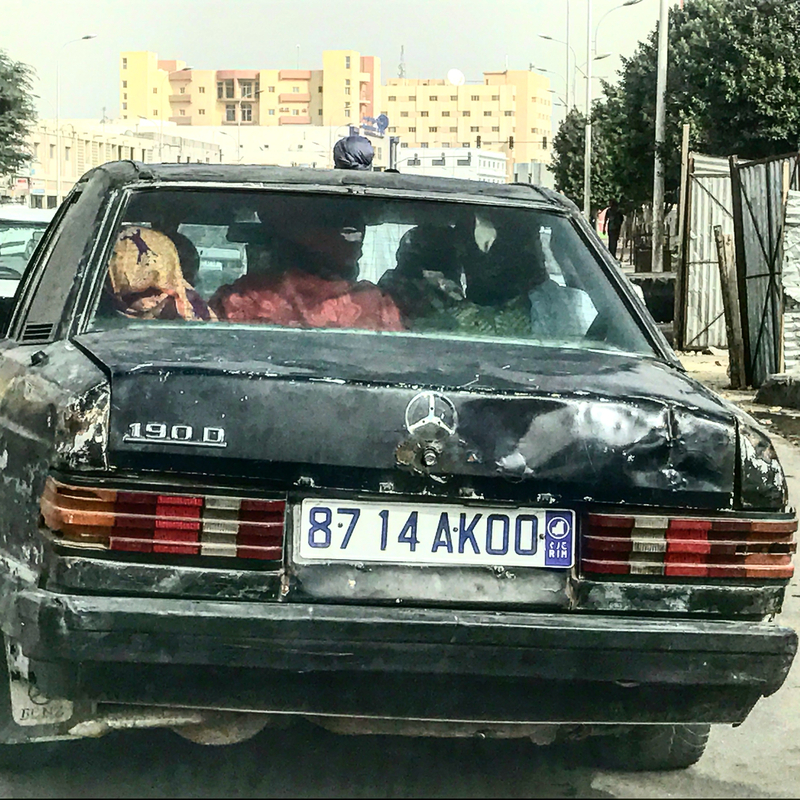 Ramblin’ Fact: One thing that I found super-interesting about Nouakchott, was the amount of Mercedes Benzes. Every taxi was a Benz, same model, and beat to death! Thousands and thousands of Benzes, all around–most of them looked like they had lost a fight with a wrecking ball! 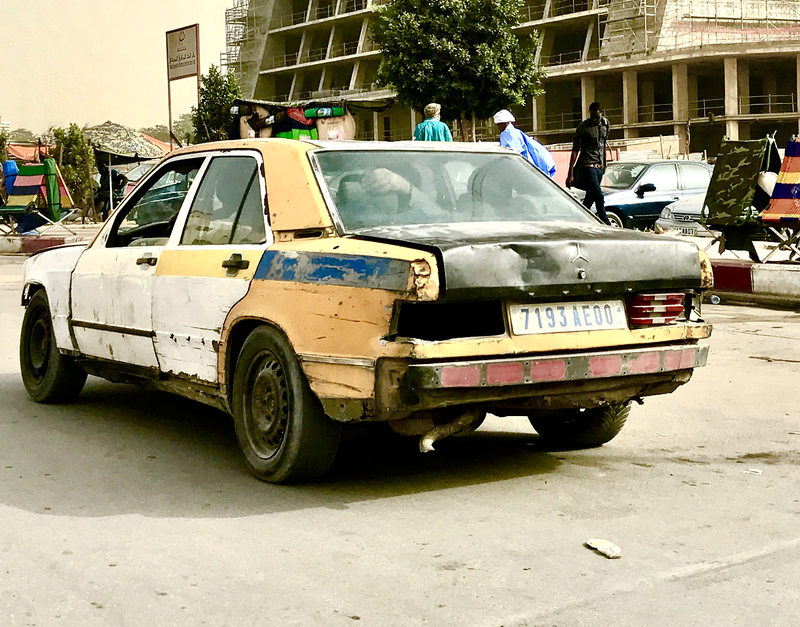 Different color panels, missing lights, dragging mufflers–I was amazed that these cars still ran, but they did indeed! I was just taken aback by the sheer number of Mercedes–every cab was a Benz, no other model! The entire lefthand rear tail light assembly is missing! 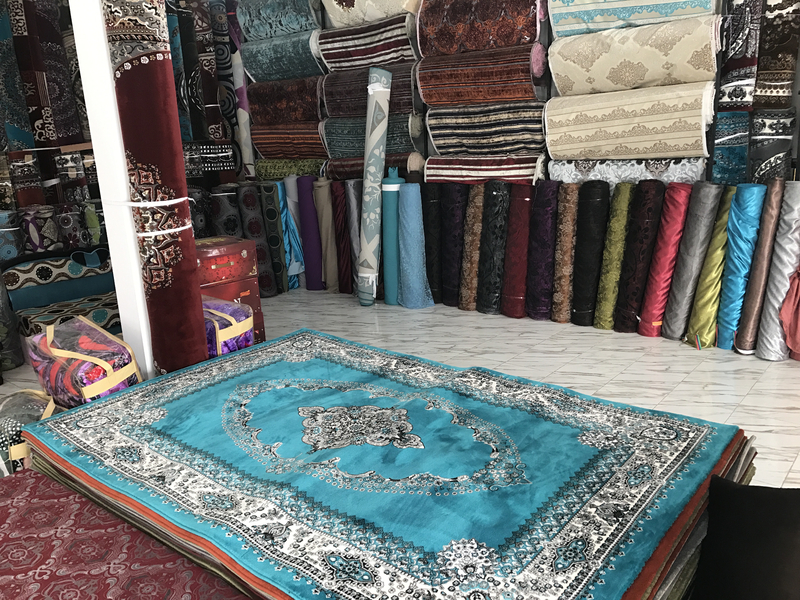 A quick stop at a carpet store. I liked the teal one! As my visit winded down, Lemine had saved the best for last. 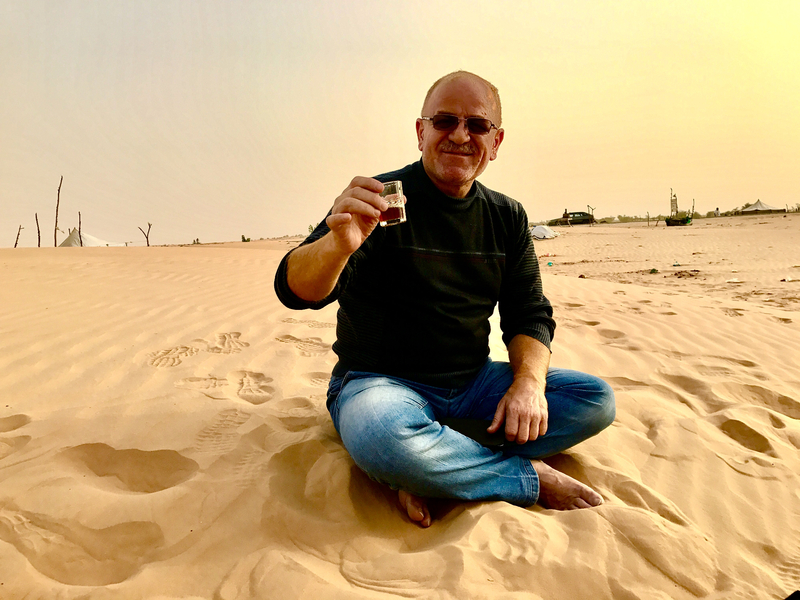 Our final activity as my two-day tour of Nouakchott wrapped up was a trip forty minutes out of town to drink tea on the sand dunes with the camels. What an experience! A quick ride out of town and there were camels! Mike-Mike-Mike…guess what day it is??? 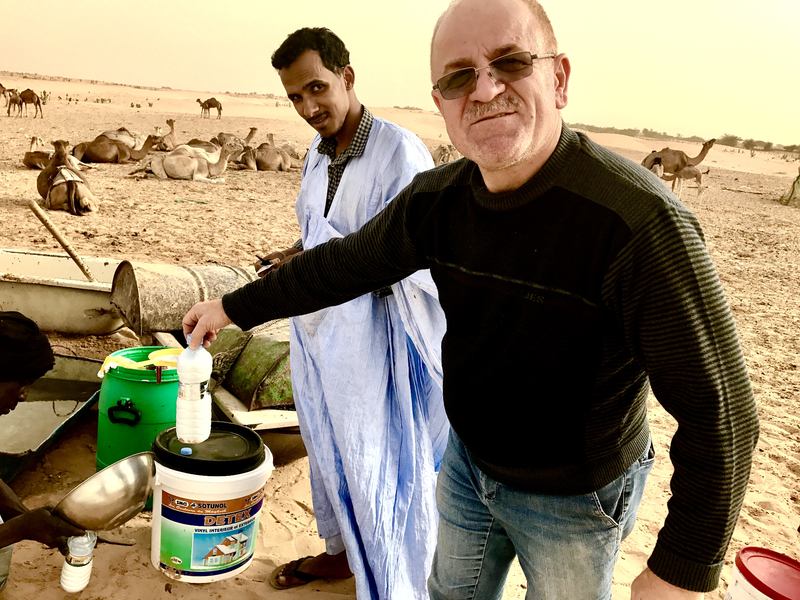 Before setting up camp to chill, Lemine stopped to buy camel milk from the local herders. 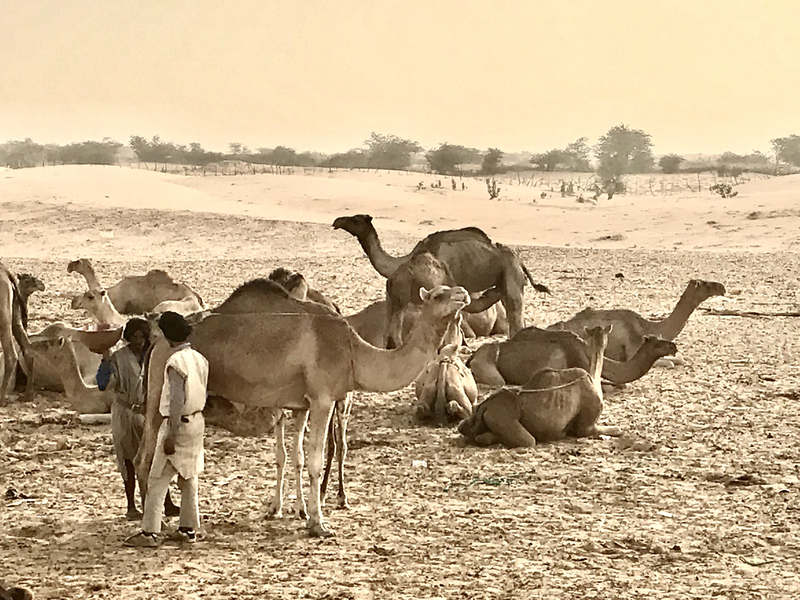 This was insane–we were served bottles of warm camel milk straight out of the udders! 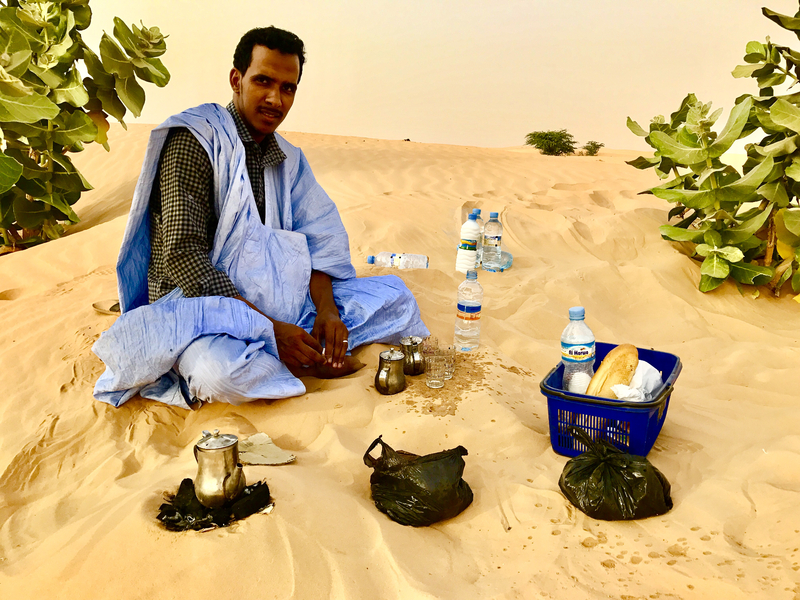 After we were presented with a couple bottles of the white stuff, we headed out on the sand to kick back on a blanket while Lemine brewed up some of that amazing mint tea! 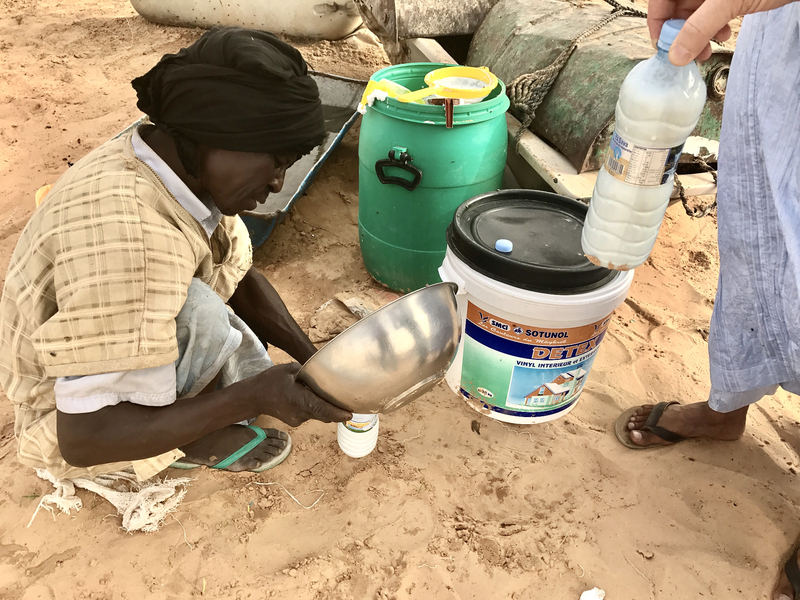 Camel herder fills plastic bottles with camel milk. Hasan showing off his milk. Lemine brewing up mint tea. The patterns in the sand looked like they were out of a music video! After our trip to the desert, it was back to the hotel to pack, and then off to the airport. 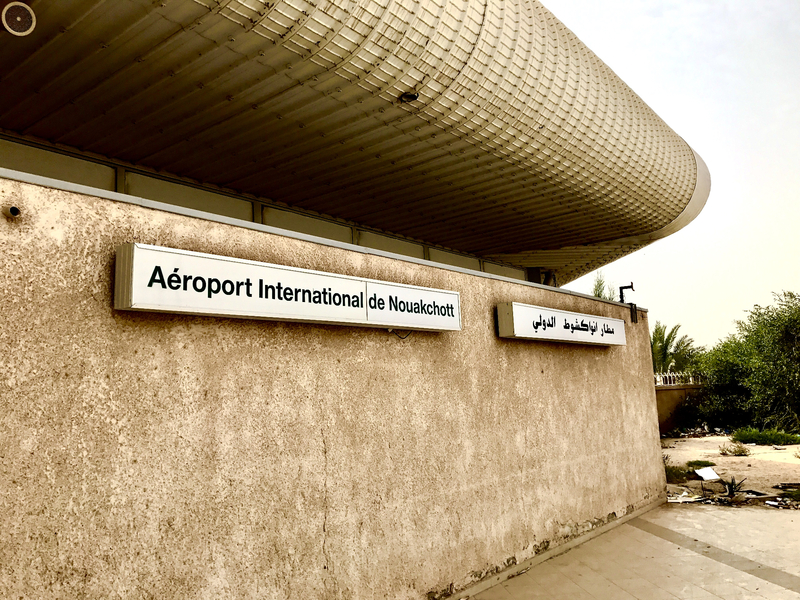 My two days in Nouakchott were amazing and like nothing I’d ever experienced. It was like the Old West, mixed with Africa, mixed with the Middle East, all rolled into one interesting land. And I was fortunate enough to explore it. Unlike some of the other places I’d visited on this journey, I wanted to stay longer in the country–there were more things I wanted to do, like ride the iron ore train and see the shipwrecks. I hated having to leave so soon. 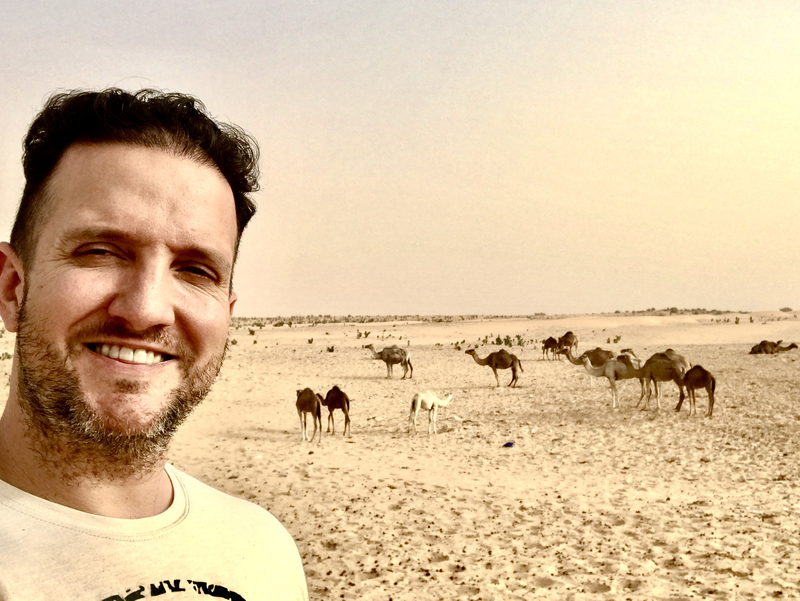 I stand by my description of “mysterious.” Mauritania, to me, still carries so much mystique. I arrived with a dozen questions and left with hundreds. 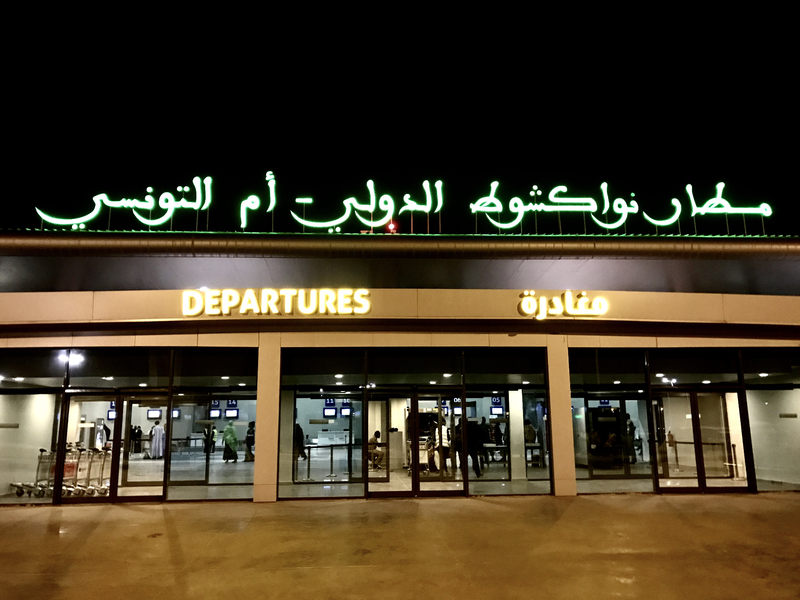 Time to go: the new International Airport. 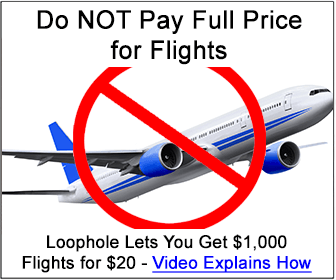 Lemine warned me that I had to turn in and convert all my Mauritanian currency before leaving the country, it was the law. 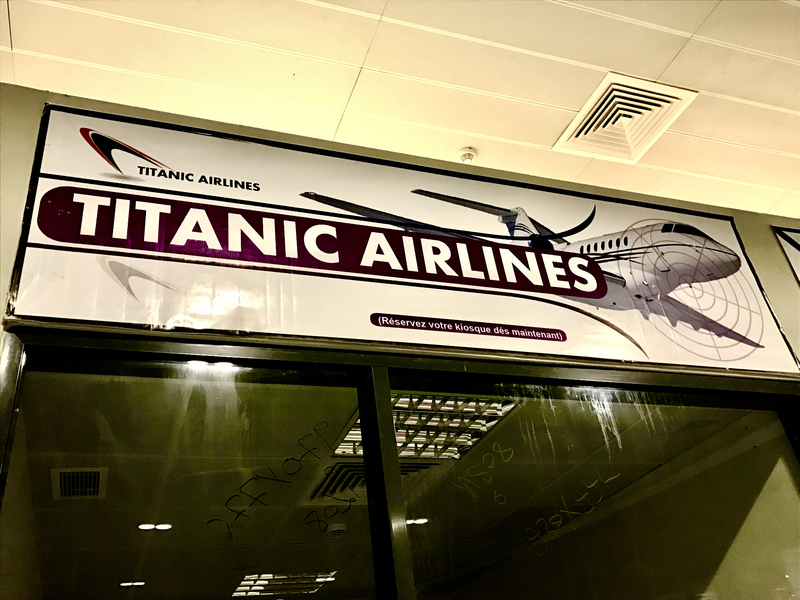 Titanic Airlines. Sounds like a great idea! Thanks so much…i literally laughed aloud at least 3 times …n i mean neighbors could hear LOUD . Reading this was quite the unexpected treat! Wow, thank you!!! That means a lot!!! 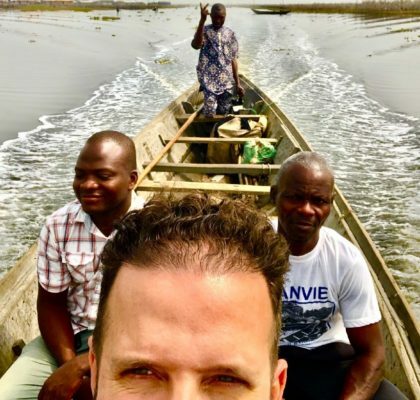 I really enjoyed this story the most from your West Africa trip. 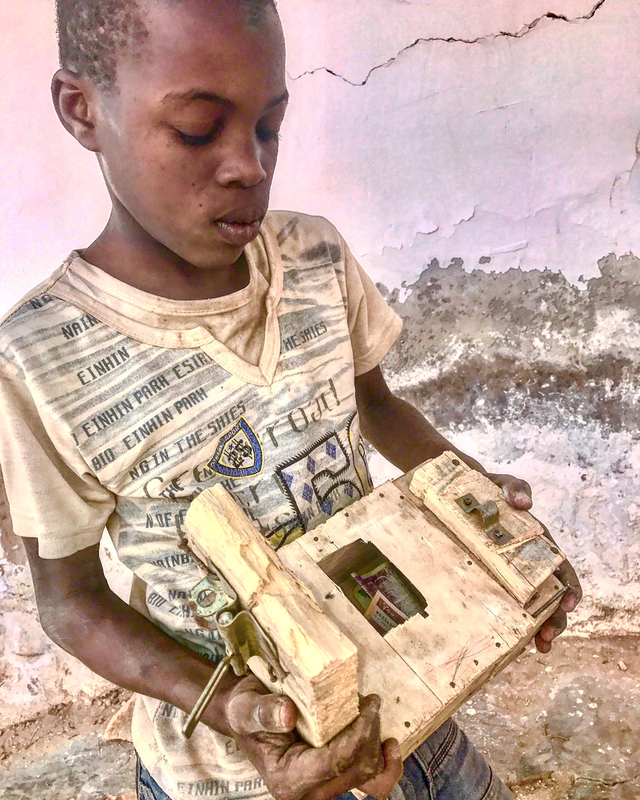 Not really sure why other than what really stuck out the most here was that your two days in Mauritania was spent engaging and interacting with daily life there. Like you said, it seems like a combination of the Old West meeting the Middle East and finding itself in the Sahara Desert in Western Africa. This country seems like it has a lot to offer the intrepid traveller and I would love to visit just to experience riding the Iron Ore train, visiting the fish market, and camping out under the stars in the Sahara. Thank you, so glad my story was able to come through to you. Bummed I missed the train and ship graveyard!!! I am so glad i found your blog. 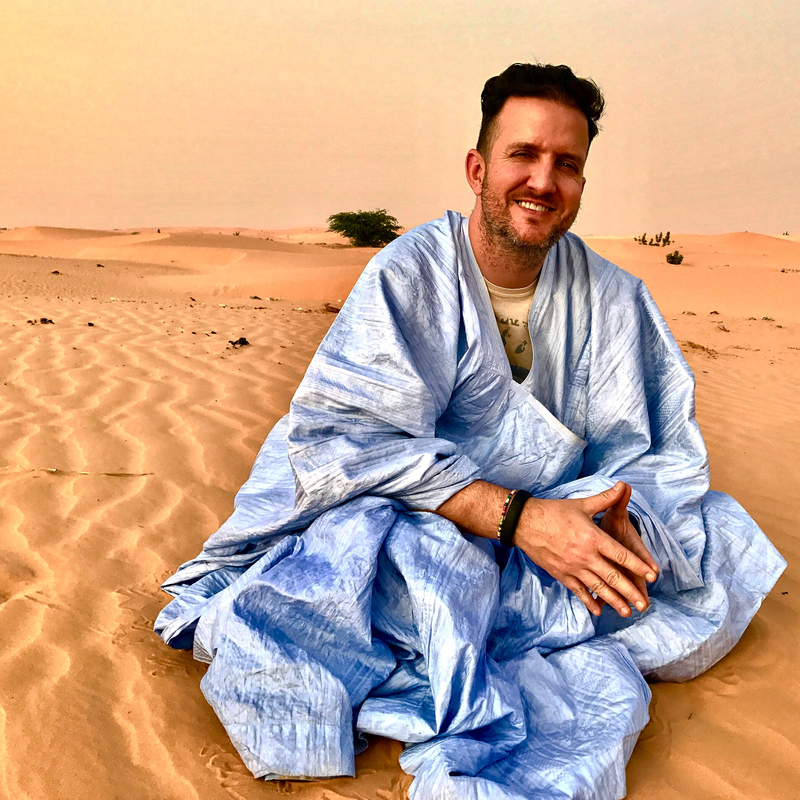 I moved to Nouakchott from Texas almost 7 years ago and I still remember my first impressions. The people, the food, the animals, and the sights were so different from anything I had ever experienced in my life. Of course when I first came here the only places I had lived or visited were located in the southern parts of the U.S. Since then I have seen so much, met wonderful people from all over the world, and had the pleasure of visiting other countries. 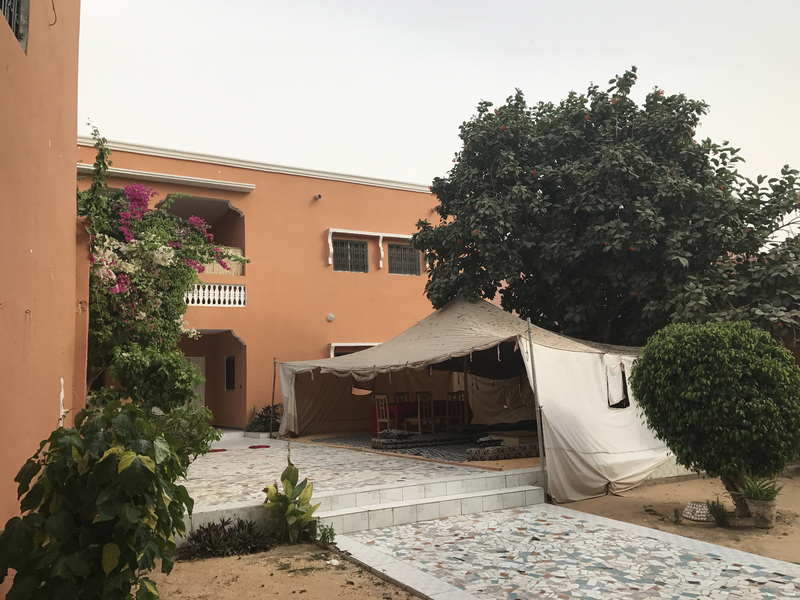 If you ever come our way again take the time to do a road trip from Nouakchott to Nouadhibou and stay at the old fishing camp Mkt (Old Air Afrique Club) or take a trip the other way from Nouakchott to St. Louis, Senegal (once the capital of Mauritania. The river crossing was….definitely an experience. You moved from TEXAS to Nouakchott???!!! That is amazing??!!! I’m dying to know why!!! My husband is Mauritanian. We met when he came to the US for college, fell in love, married, and had two beautiful children. Eight years later while sitting on my front porch I decided to give my children a life that I never had and one I could not give them if we stayed where we were. I wanted them to experience different cultures, languages, and have a wider range of education that didn’t just come from books. I had never been outside the US and had barely even seen more than the southern states of the US. 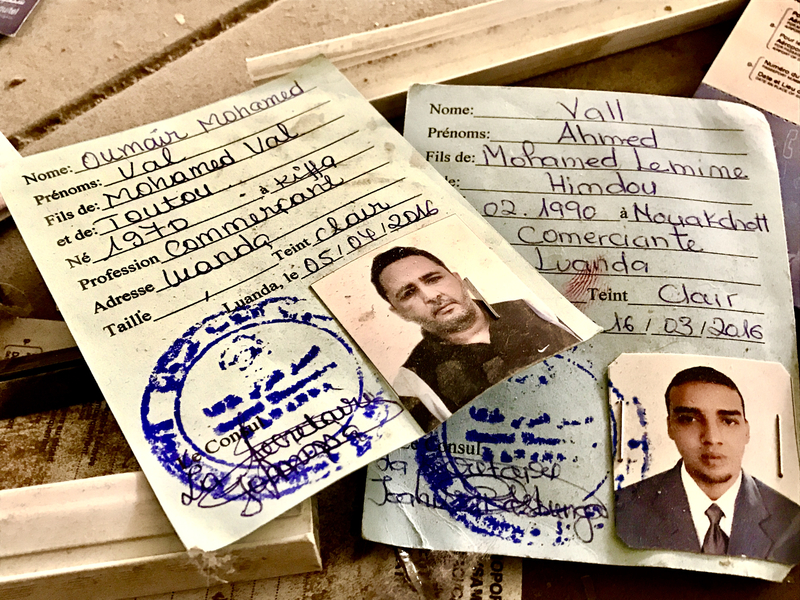 We sold everything we had to start over in Mauritania. My story is a simple one but I have heard some awesome stories through the years of why and how people came here. I have also met some wonderful people here whose stories should be made into movies….my father-in-law being one of them. Incredible man. Absolutely incredible!!! Where are you staying? 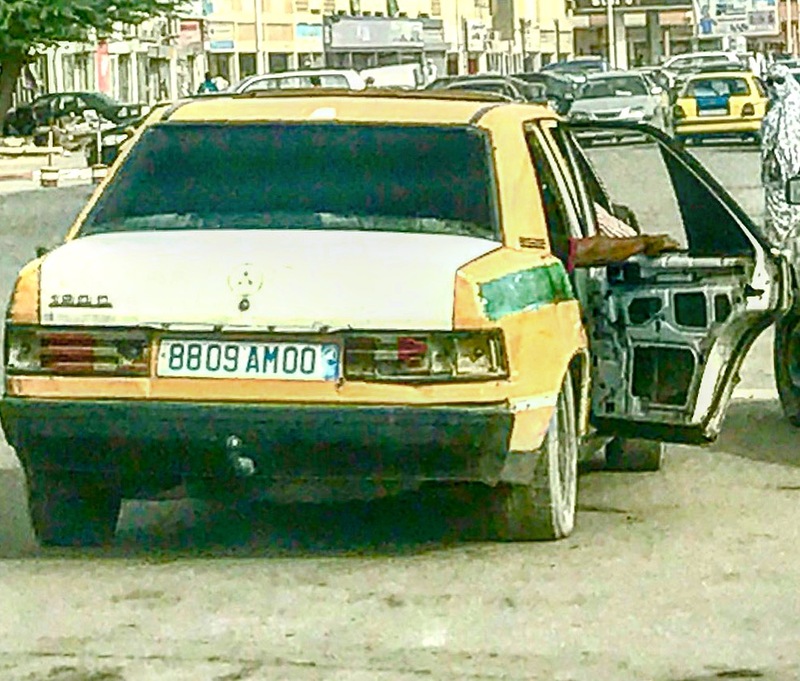 Nouakchott? I am so intrigued with this story, wow!!! Yes, I live in Nouakchott. If you ever come this way again you are more than welcome to stay with us and experience more here. It helps with the costs and we have the room. 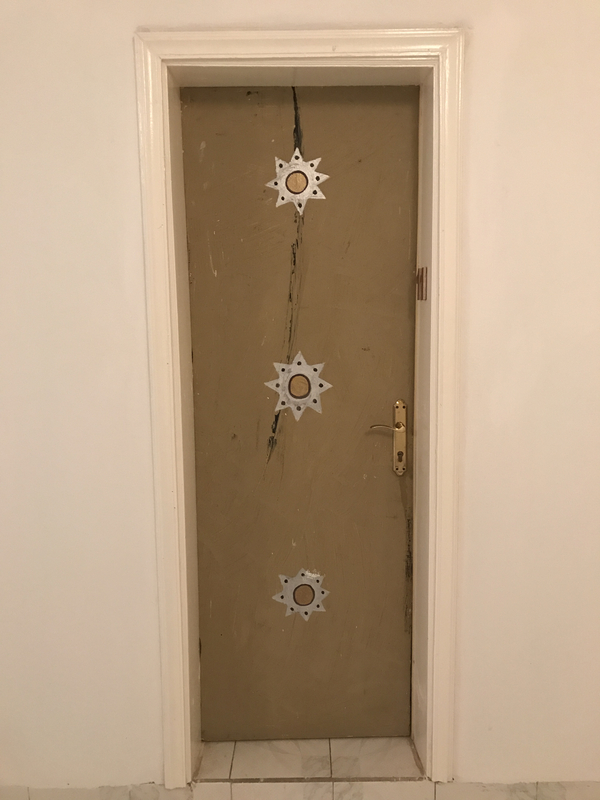 😉 It is the way here to open our homes. So awesome of you!!! Thank you!!! Please send me a note on facebook please? Our facebook contact is to the right on this website. Your blog is so much fun to read! 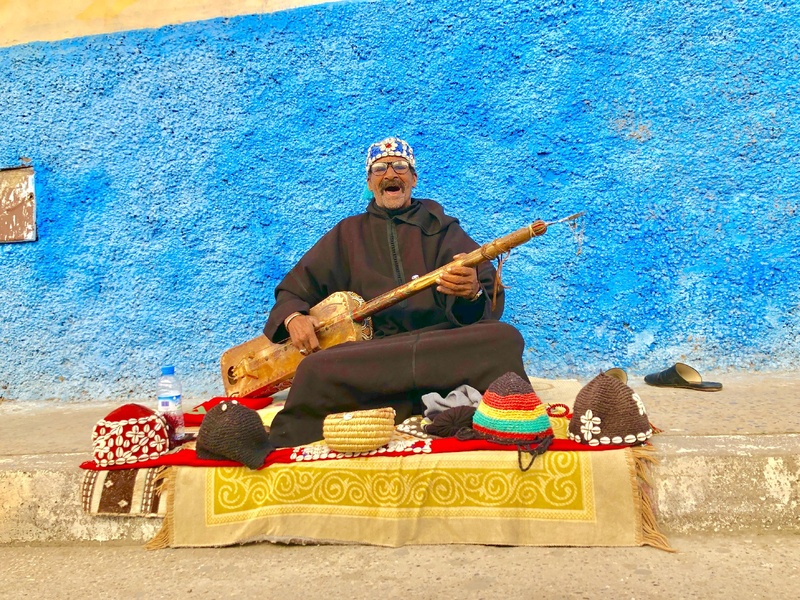 I’m heading to North Africa in August and I think I will add Marutania to the list! 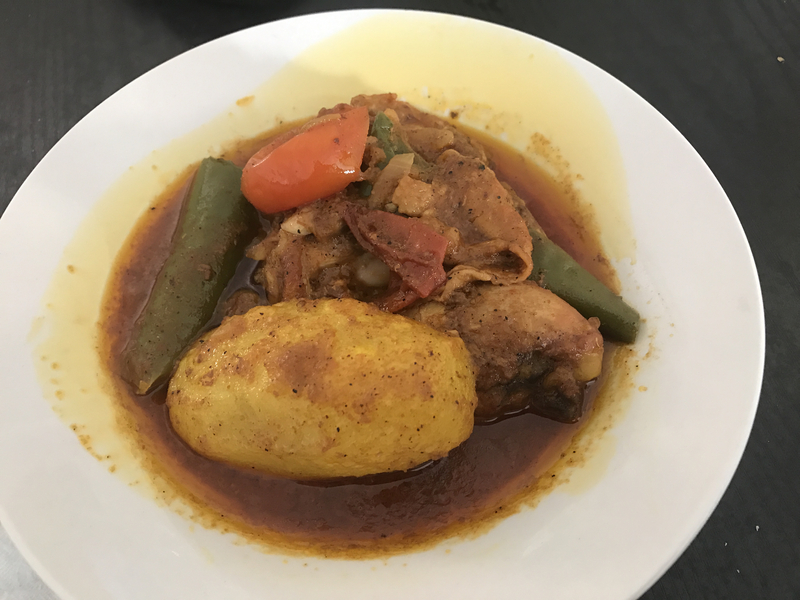 I’ve traveled through Africa several times and I am unsure why I have never considered Marutania – thank you for the eye opener. How did you find the visa process? Perhaps you mentioned it, but I’m commenting after reading about ten different enteries can’t recall specifically. 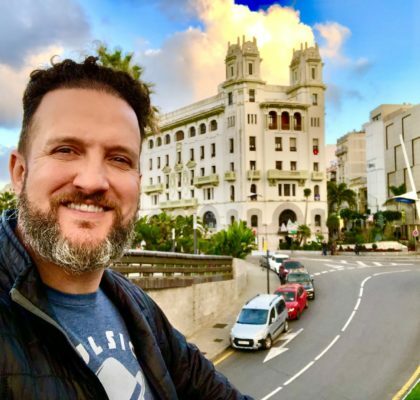 I love to travel myself and I’ve gotten many ideas from your blog. Thank you! Kat, reading YOUR message has made this entire blog-thing-project worth it. I’m just doing it for fun and in “hopes” it may be entertaining or useful to even ONE person…so I was really happy to see your comment! For Mauritania, I did “Visa on Arrival,” as the only way to get it in advance is to go “in person” (not via third party) to the Mauritanian embassy in Washington DC. They require biometrics, which is why you can’t have a company like Travisa handle it for you. The visa on arrival was easy, with no problems. 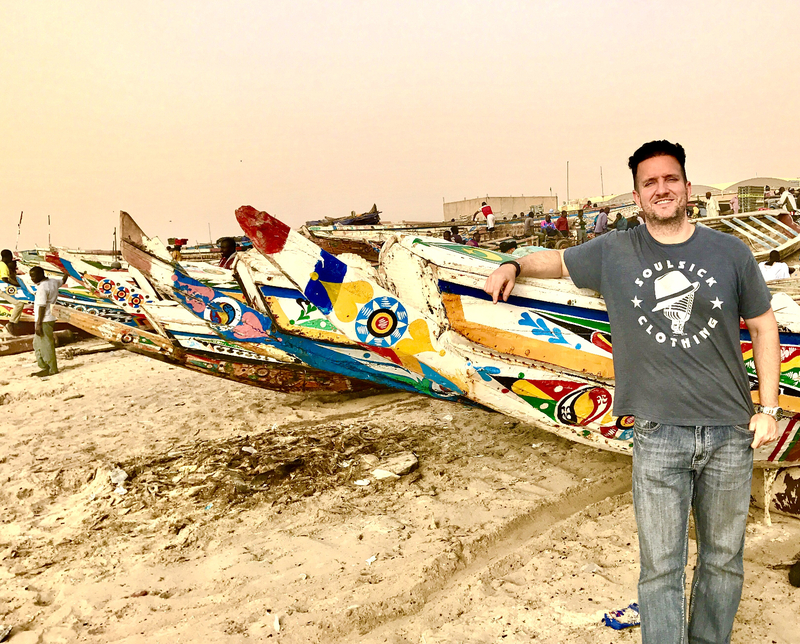 As you can tell from the blog, Mauritania is super cool!!! How did you find my blog? 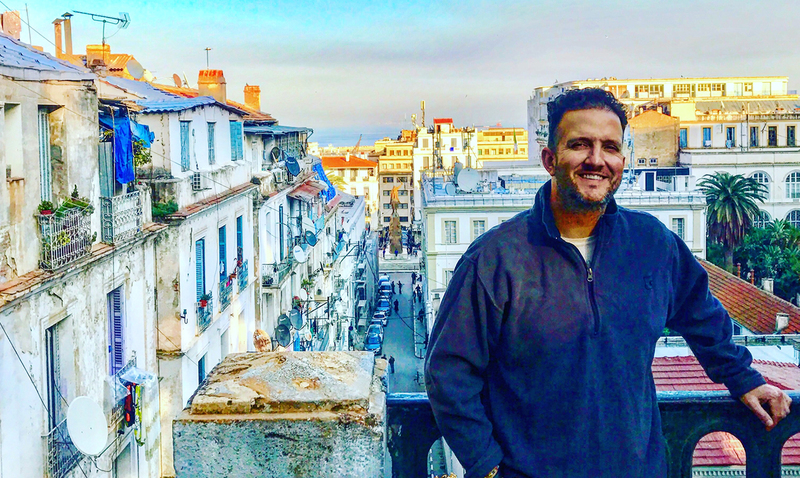 And where all in North Africa are you headed to? Exciting! Hi Randy! Thanks so much! I’m thinking to start in Morocco, and head to Algeria, Tunisia, North Sudan, and now, Mauritania. Really I am still just planning, and I may add some West African countries as well. I love it!!! My guide in Algeria was the BEST!!! I love your itinerary/plans…what a fun trip! 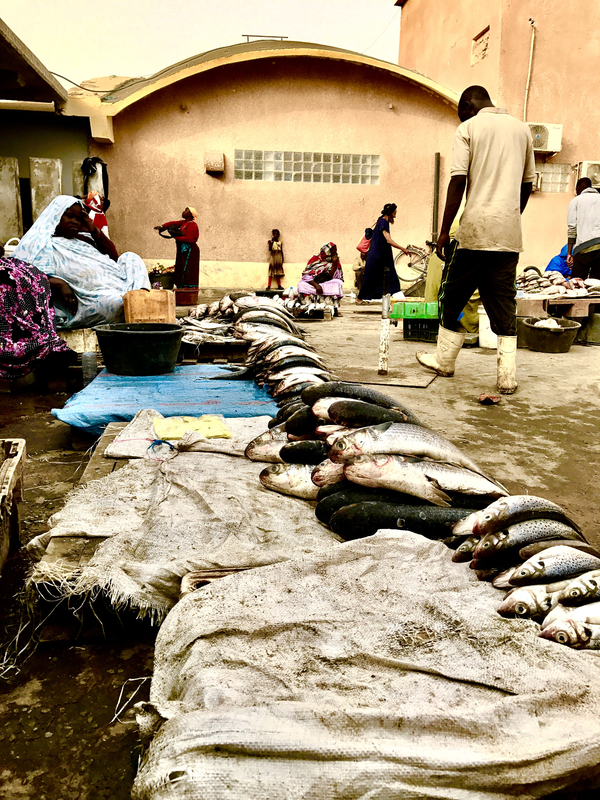 Glad you’re looking at Mauritania: please don’t miss Nouadhibou. I made the mistake of missing it, and I didn’t get to see the big old ships and ride the iron ore train!!! Send me a note in the “contact” section so we can exchange emails. Safe travels and let me know if I can help. 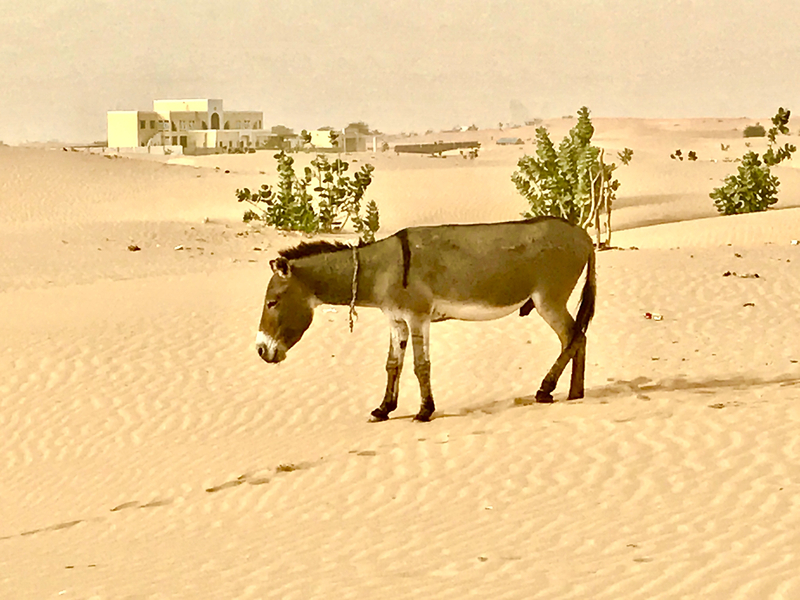 Mauritania is an incredibly interesting country. 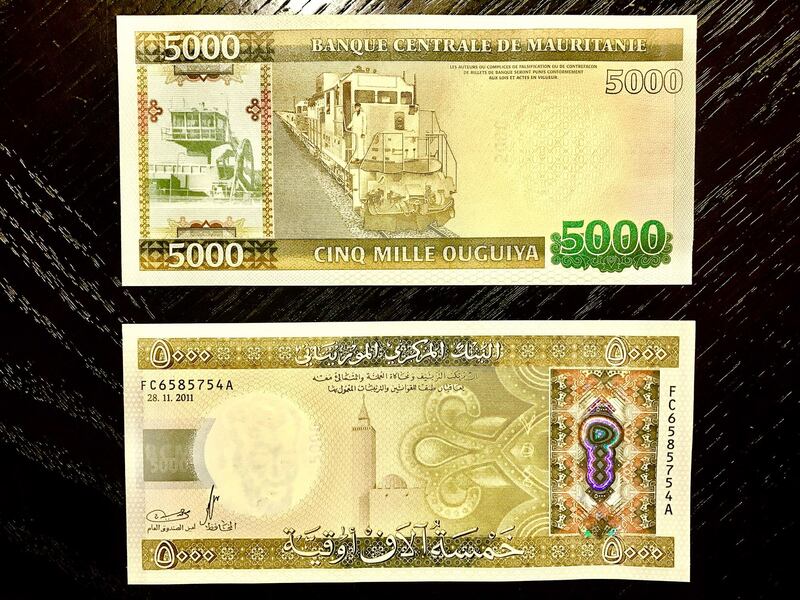 Sad you did not get to ride the Iron ore train from Nouadhibou to Choum/Zouerat! One of the most interesting things I have done in my travels. 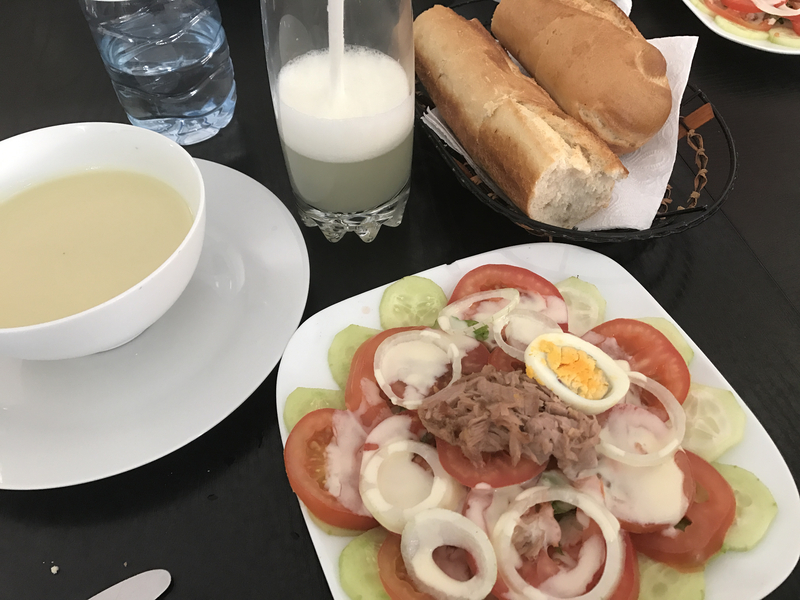 Also Terjit, Chinguitti, and Ouadane are all worth the visit in Adrar. 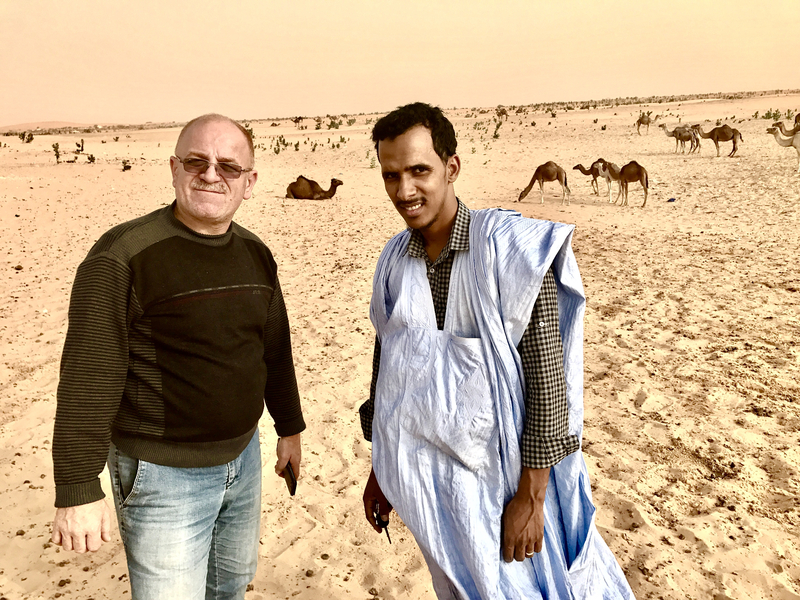 Culture wise Mauritania is very interesting (where North and West Africa meet) and there are few to no tourists. Very safe country as well. Worth a visit, especially if you like to go where few tourists visit. So interesting!!! And I was so bummed I missed the iron ore train and the big shipwrecks!!! I hope to be back soon!